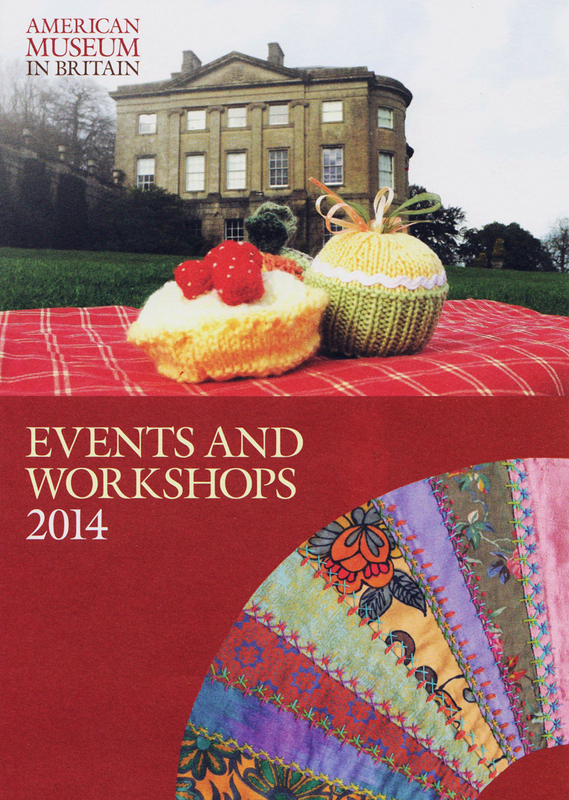 My Crazy Patchwork fan design on the cover of this season’s events catalogue at the American Museum. 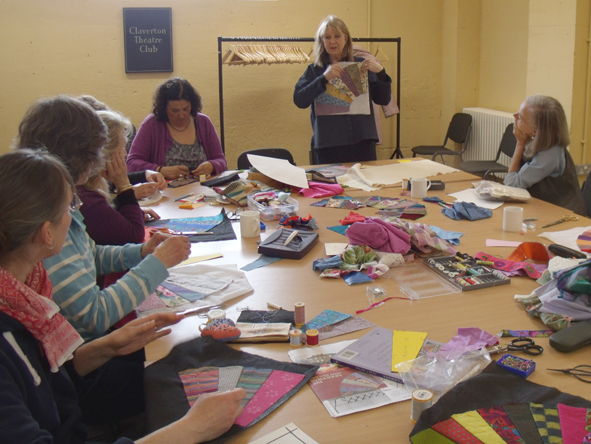 I have been getting out and about recently and have been taking a workshop at the American Museum in Britain, which is situated just outside Bath. 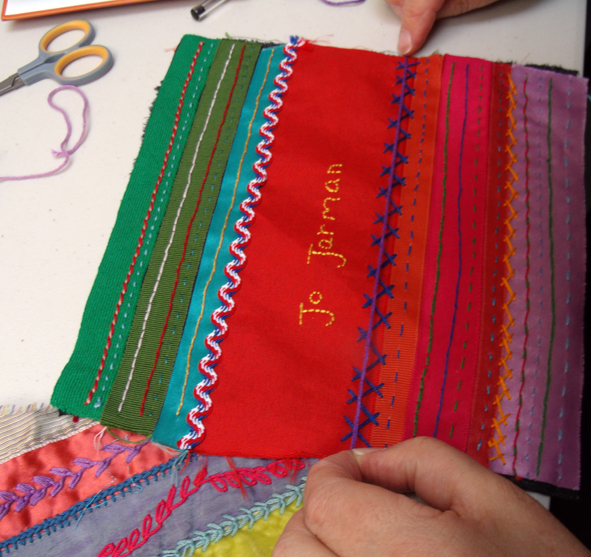 I have been asked to deliver 2 day long workshops by their education officer, Zoe Dennington (who found me via this blog). 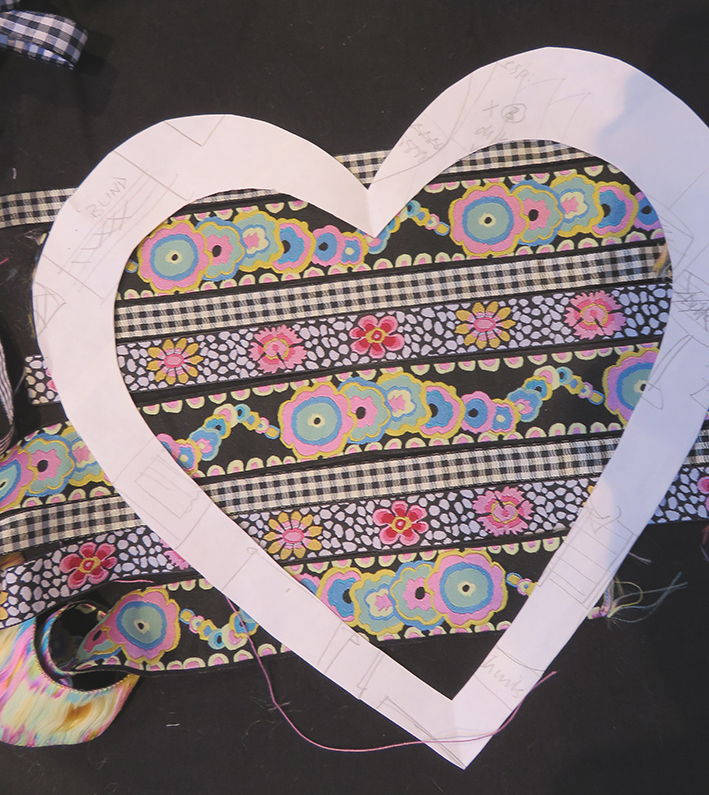 Zoe asked me to use Crazy Patchwork techniques for classes to run at the same time as the current vibrant Kaffe Fassett exhibition being held at the museum for several months.The second class is in October to make a crazy patched and beaded heart. 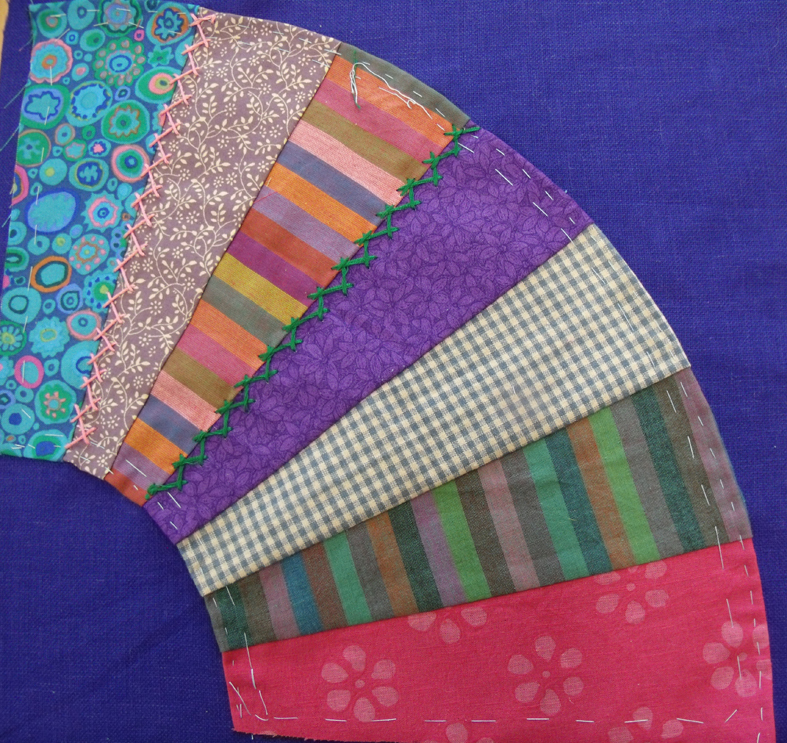 Luckily I was given a batch of cotton samples of fabrics designed by Kaffe Fassett to use in my workshop by a friend, Susan Berry ( who produces his very popular patchwork and knitting books) and they certainly livened up my Heart Space Studios fabric stash….I had designed a special project for this session, a simple design of a fan and one of the most popular motifs used in traditional of Crazy Patchworks. 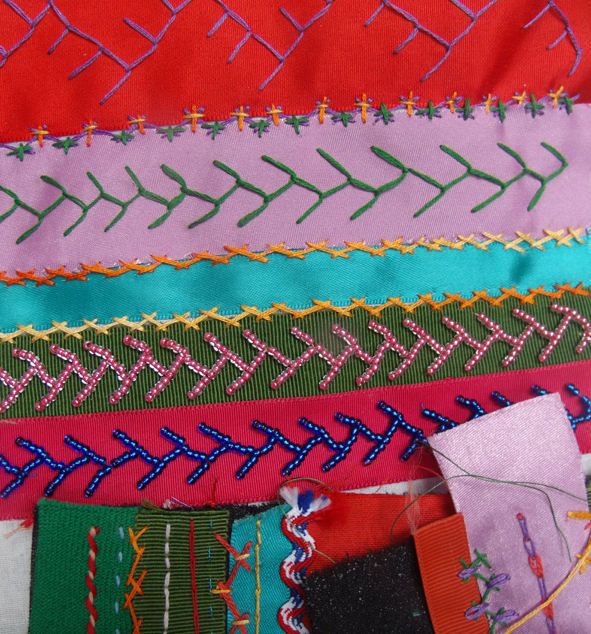 I reasoned that if I provided patterns for the patches then things might go quickly and everyone would finish – well that was the idea! 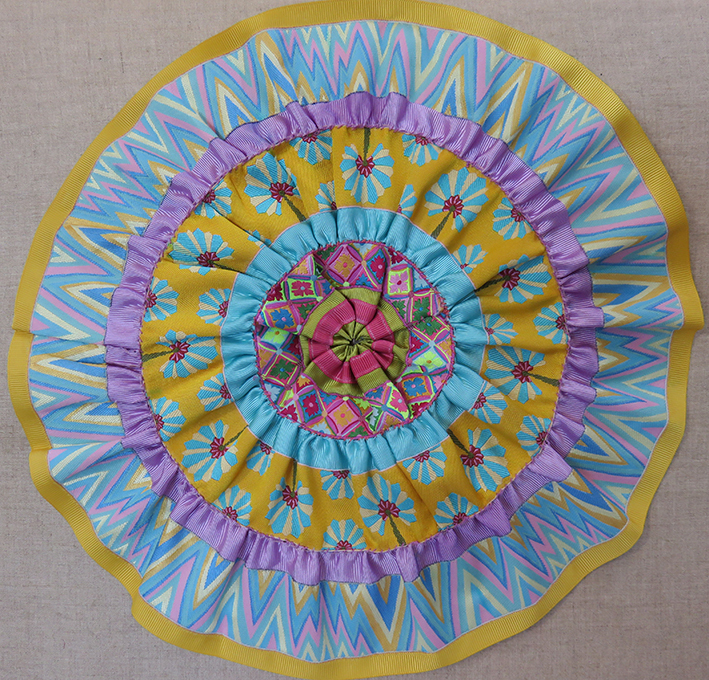 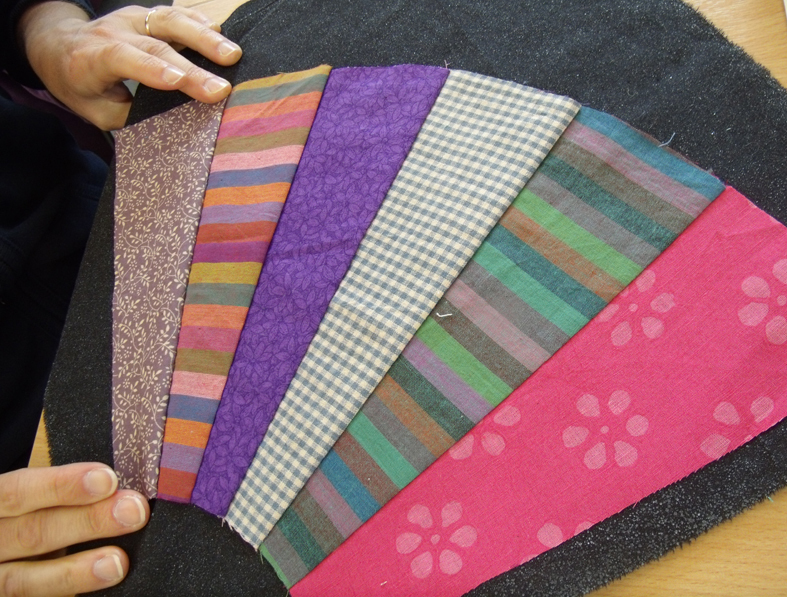 We started off by choosing the fabrics for each fan – there are 7 sections in the design that I had created for the class, which means less embroidery than my sample. 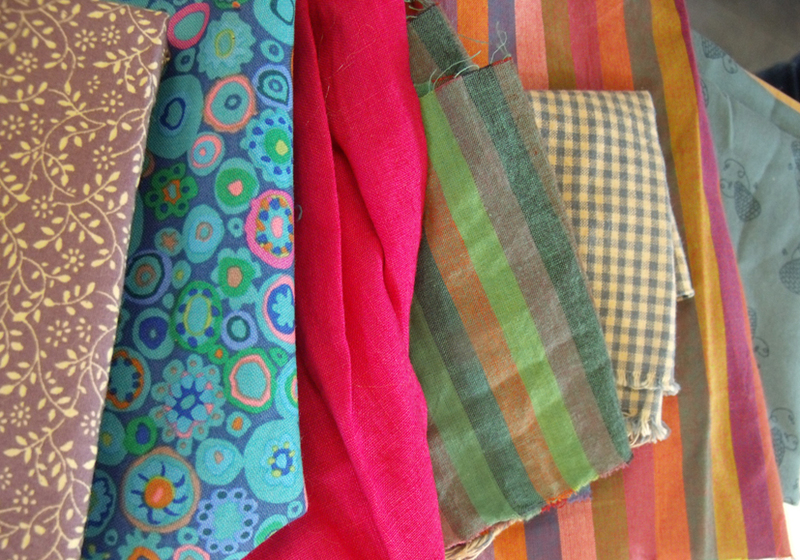 I had also asked people to bring whatever they liked of their own materials as well. 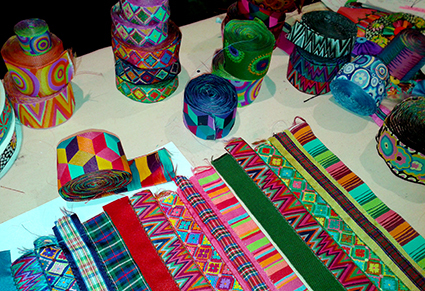 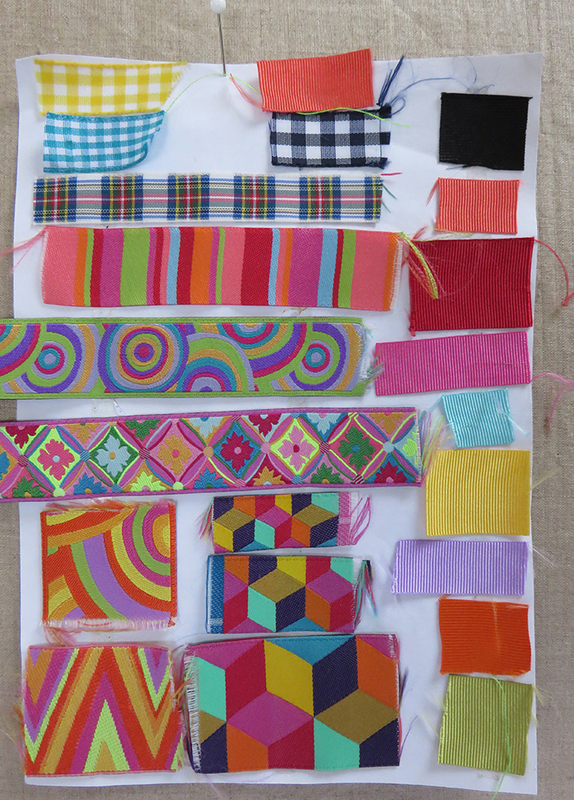 The fabrics chosen were quickly organised into many different striped bands – I explained about balance of pattern to plain fabrics and crucially for a small colour scheme, to separate a few colours from the patterned fabrics and use them as plains or solids to show up the patterns. 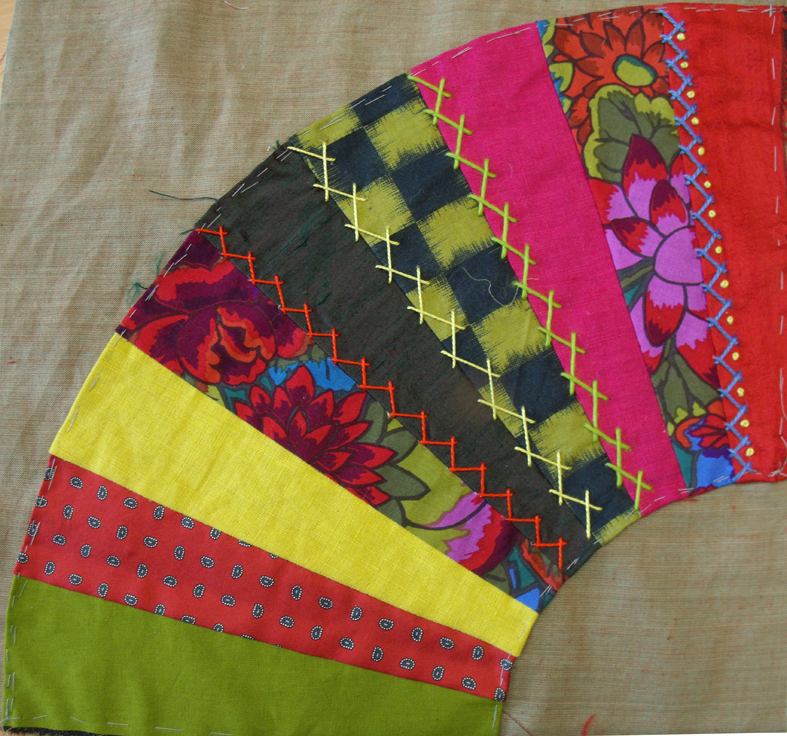 And not to worry too much about getting the colours perfect at this point as later the coloured stitching over the seams would help with the colour co-ordination of the whole piece.
. Once the fan had been pressed and trimmed the next task was to find the coloured ground to applique it onto…I find that this is quite a good way to get people to appreciate the difference that different coloured grounds can make to the overall piece. 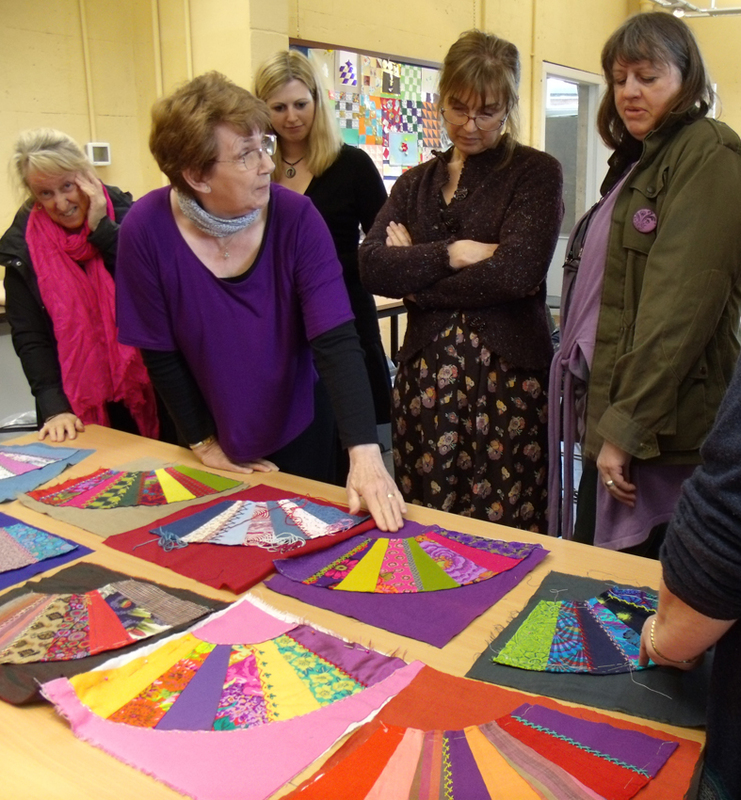 a rare shot of me teaching – explaining how to deal with coloured ground fabrics using a soft and subtle piece of patchwork. 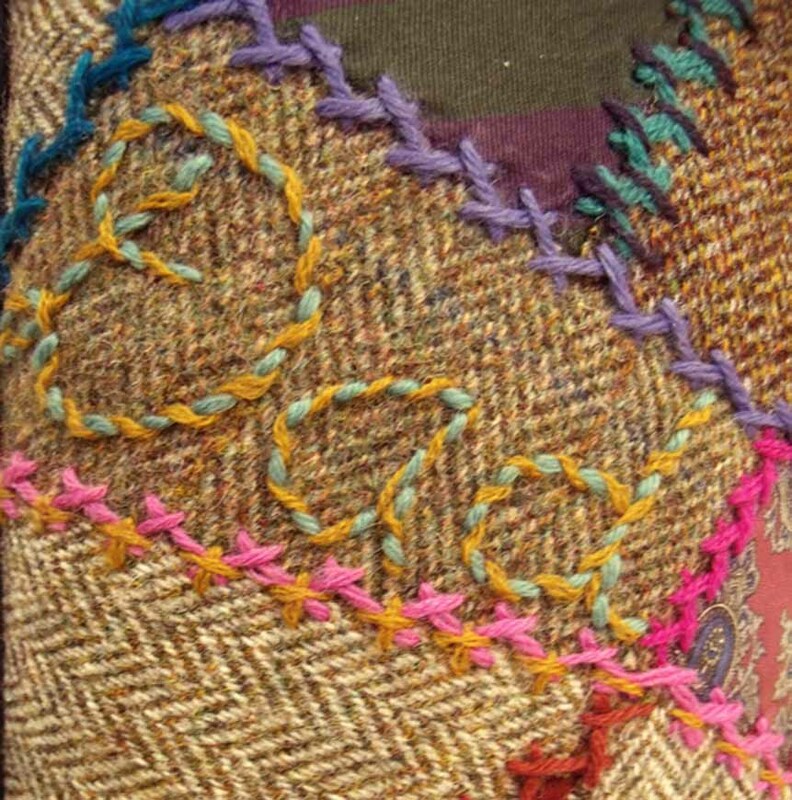 Now to start embroidering – I had chosen to demonstrate 1 basic row of herringbone stitch and then show how to add extra stitches or I should say decorations…it is my favourite decorative embroidery stitch as it can be developed so that it looks almost like a braid. 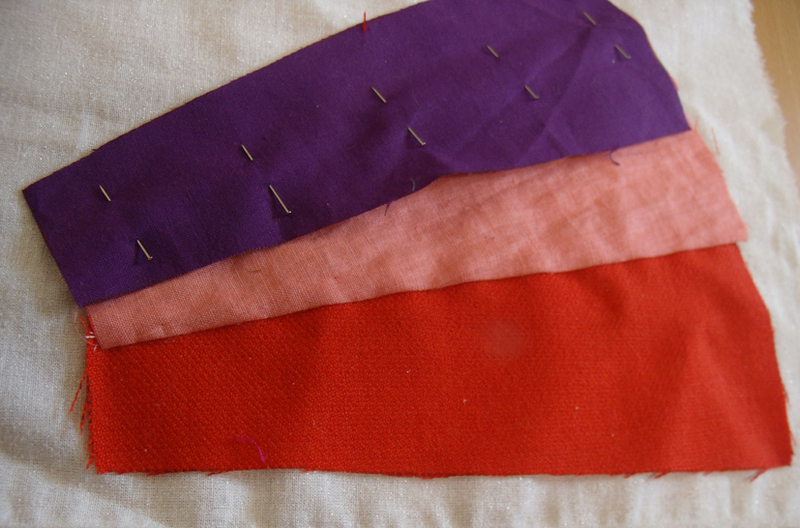 But to begin just a couple of well spaced rows…and then the extra colours can be added. 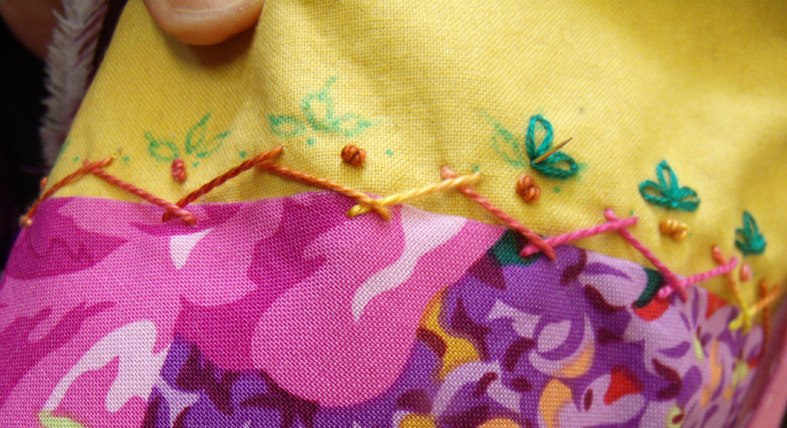 I like to use contrasting coloured stitches on the seams – they are very obvious but then I do not think it worth doing any decorative hand embroidery if it isn’t to be noticed! 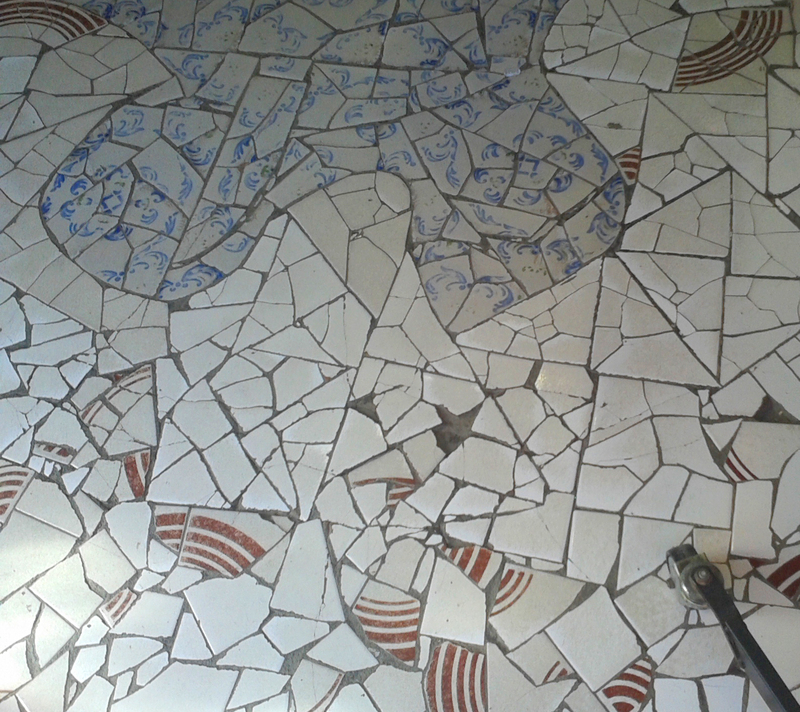 At the end of the session we put all the unfinished patchworks together on a table to assess them for further additions…. 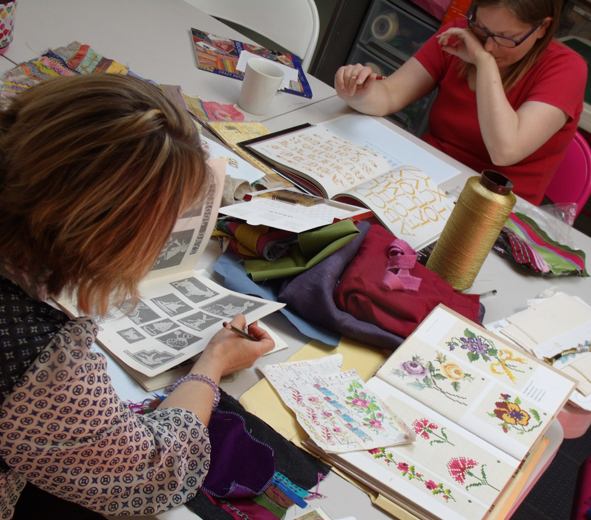 you can now see the affect that the Kaffe Fassett fabrics had on the works – but you would not think by looking at this picture of some of the group around the table that they actually liked what they are looking at !
. 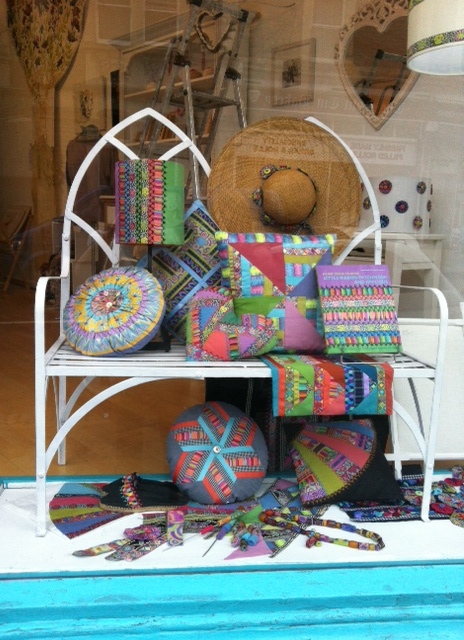 Everyone faithfully promised me that they would finish the fans and send me photographed results – watch this space……. 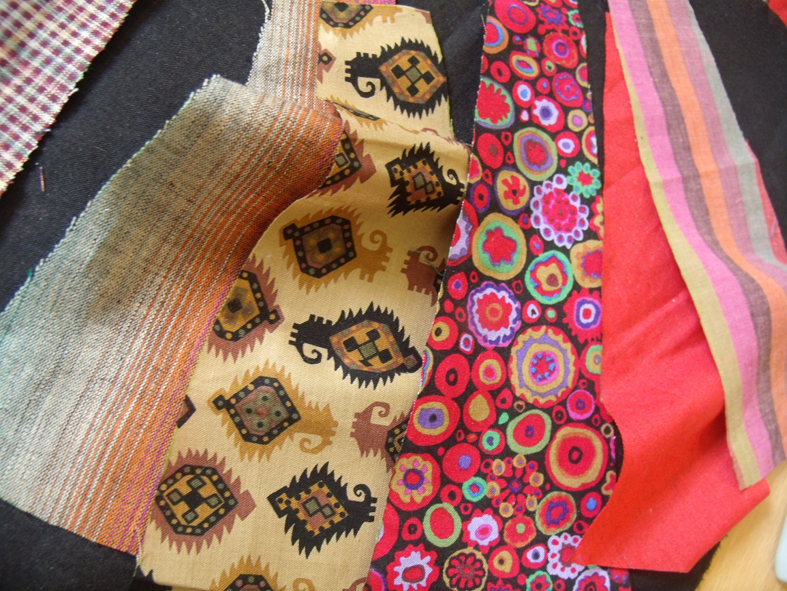 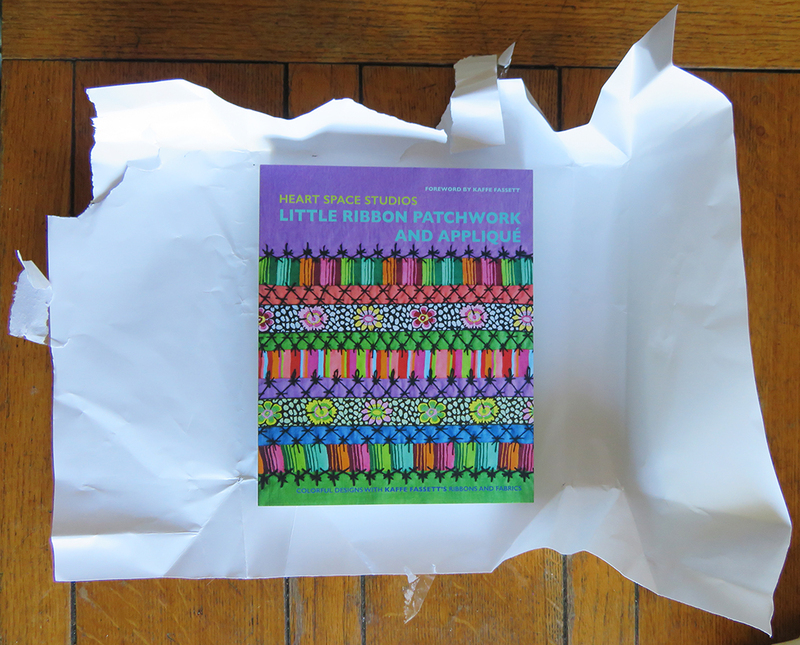 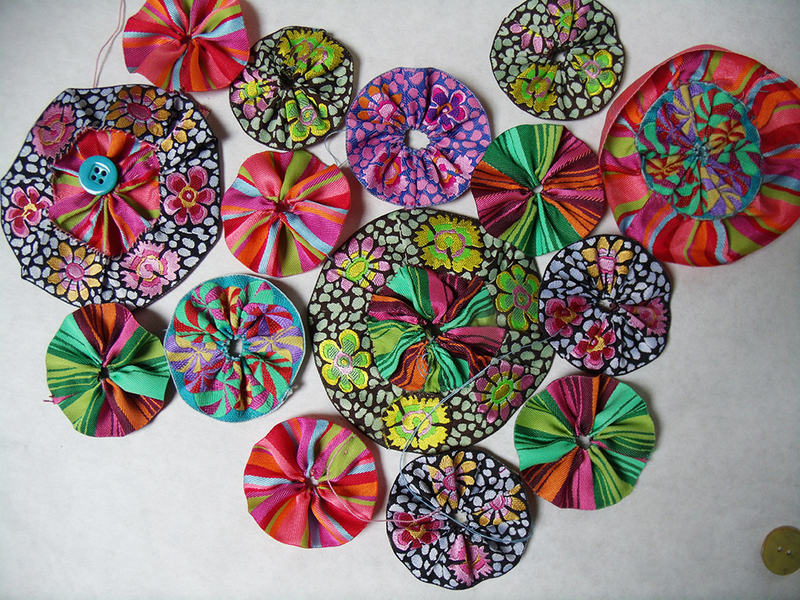 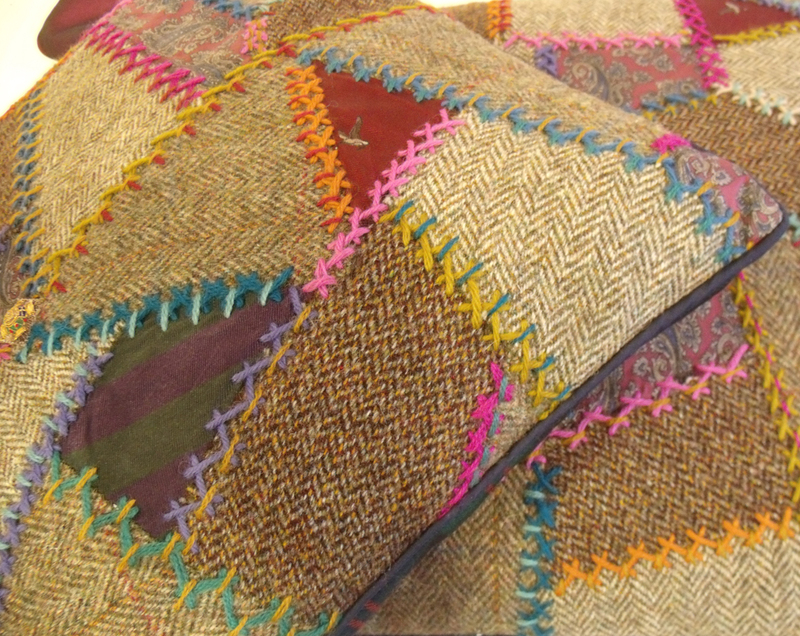 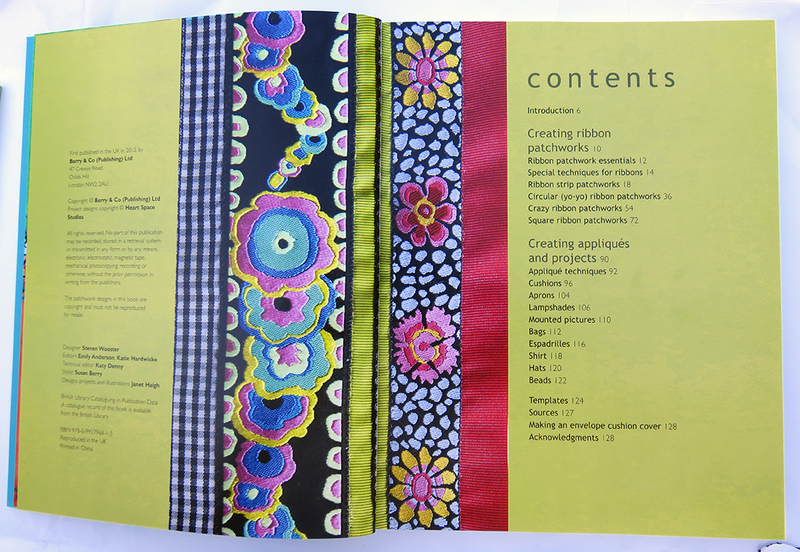 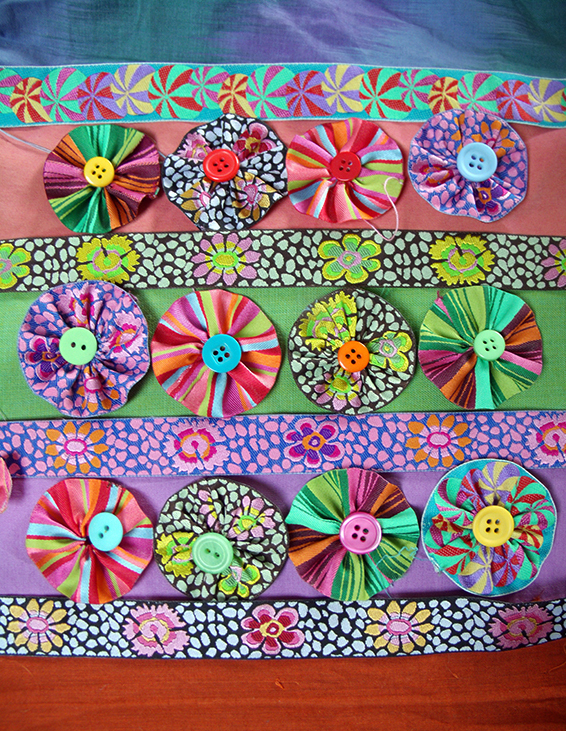 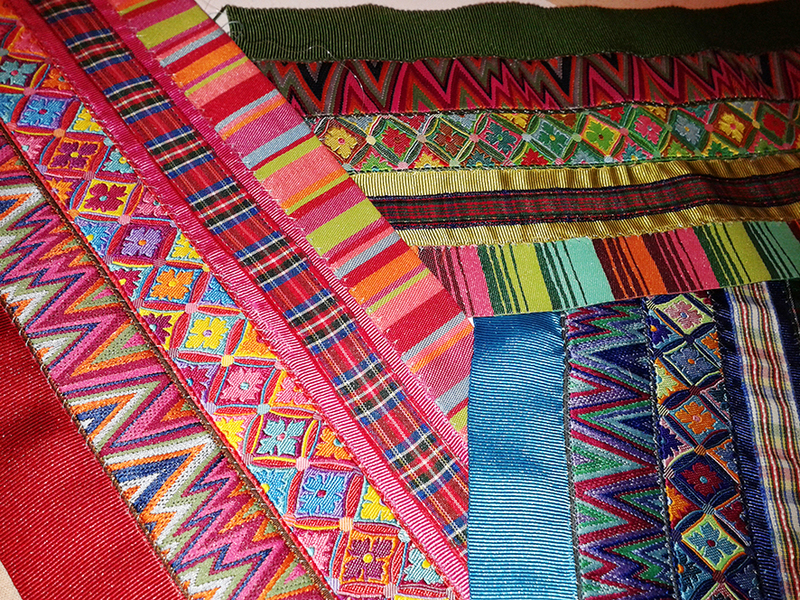 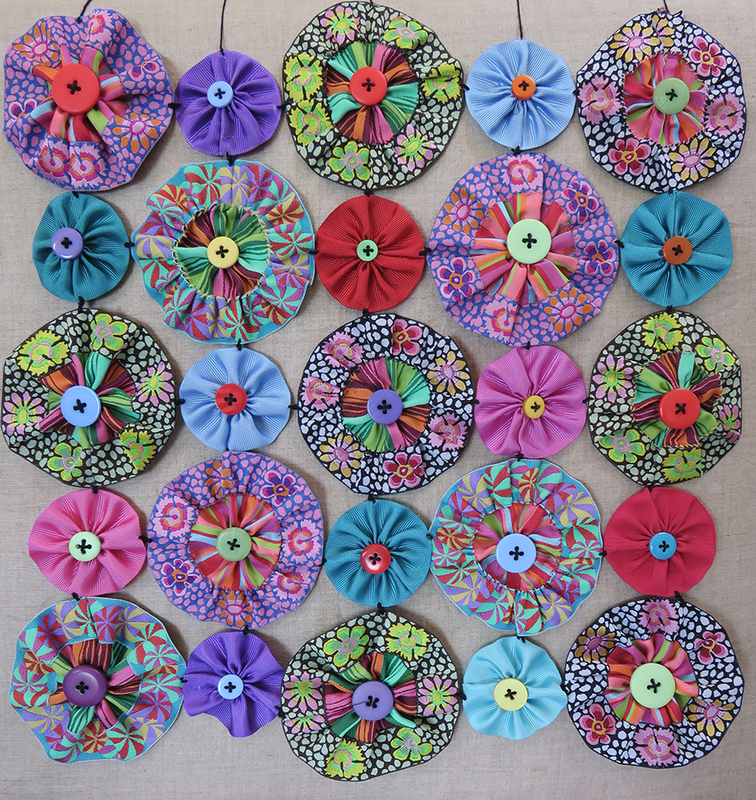 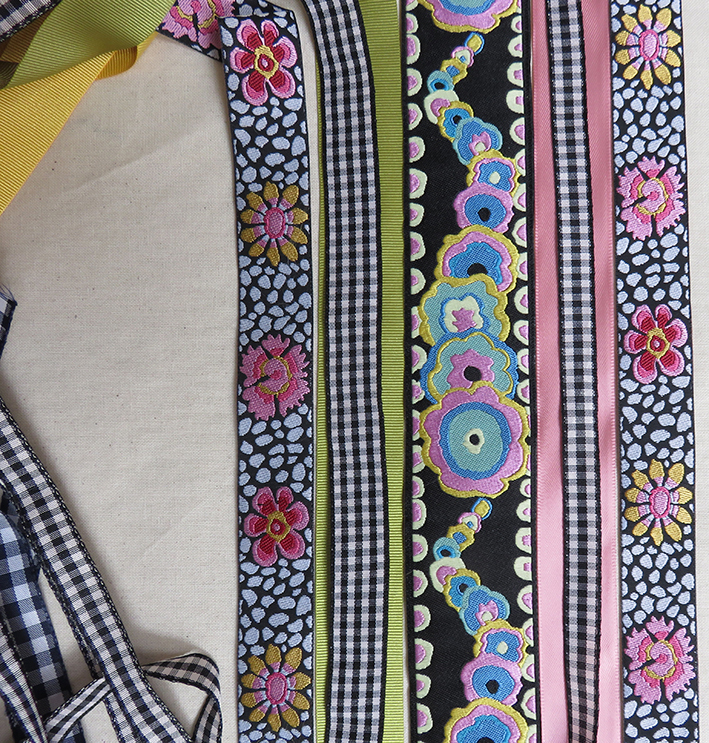 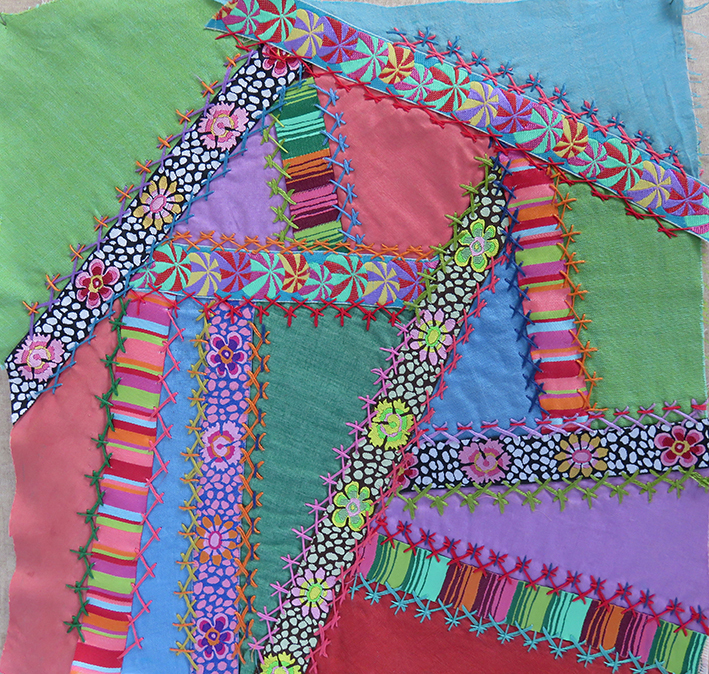 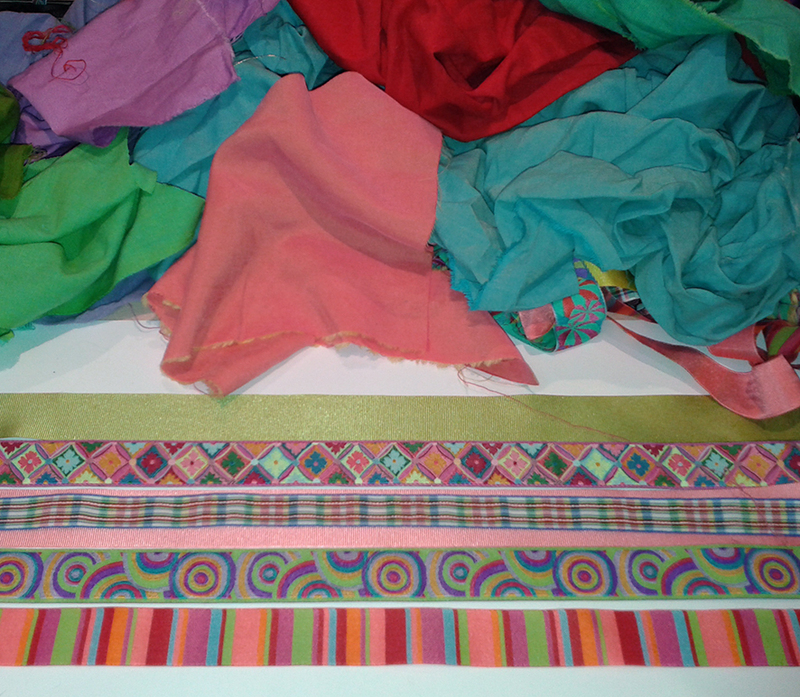 Categories: Crazy Patchwork, Make - Do and Mend, Stitching | Tags: American Museum in Bath, colour clash, colour co-ordination, crazy patchwork, embroidery, Kaffe Fassett | Permalink. 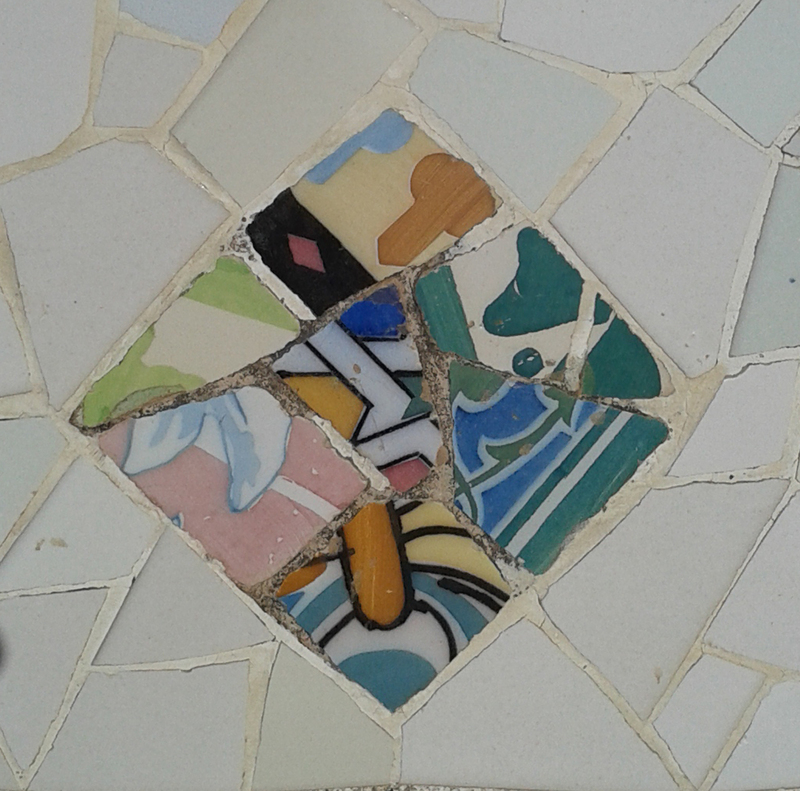 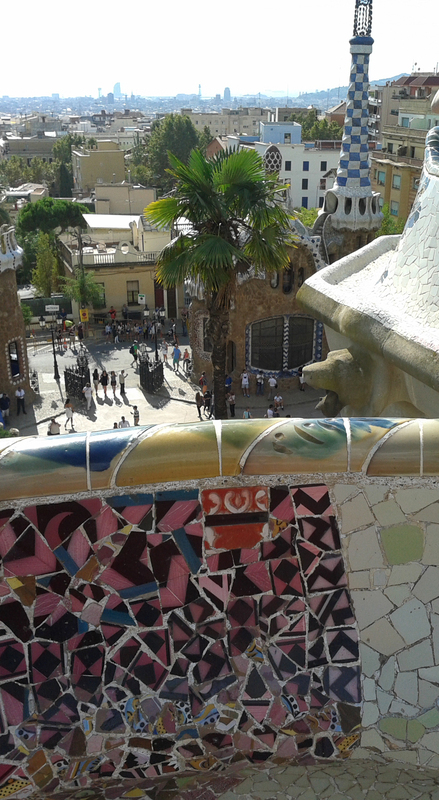 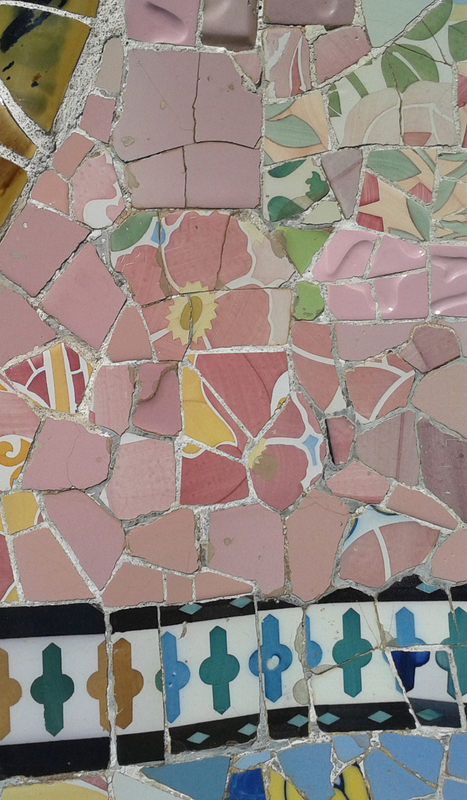 Crazy Barcelona – crazy patchworks everywhere, but not in fabric – in ceramic, stone and marble. 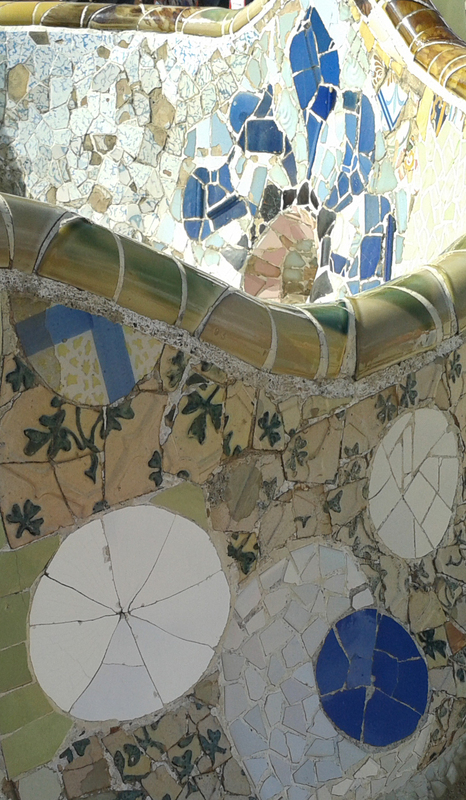 OK then, crazy mosaics, but whatever you call them there is no better place to appreciate them than at Parc Geull, designed and built by Antoni Gaudi in the first 14 years of the 19th century. 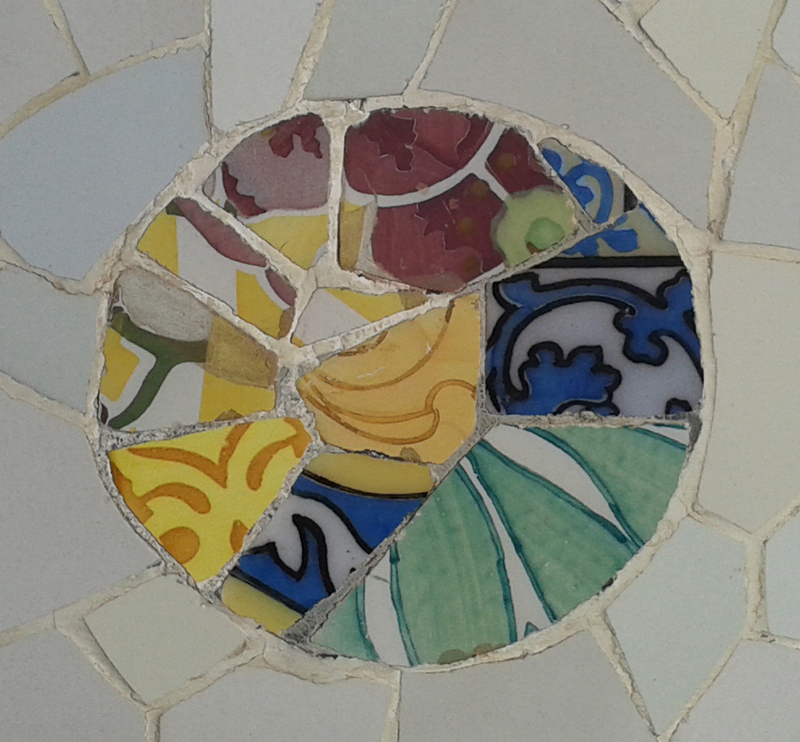 I have seen images of these mosaics before but never appreciated the size and the sheer exuberance of the patterns. 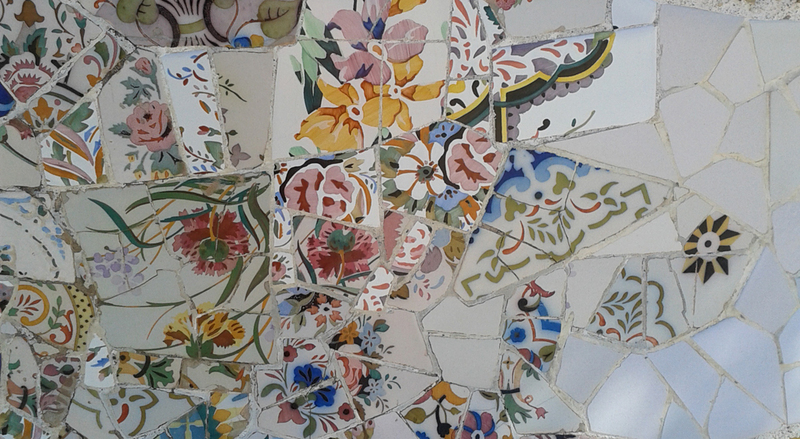 I was delighted to see broken plates, tiles, and rounded roof ridge tiles put together in a myriad of ways, some where just pretty with sections with large flowers that had been broken but kept intact when cemented together and then surrounded by all shades of one background colour. 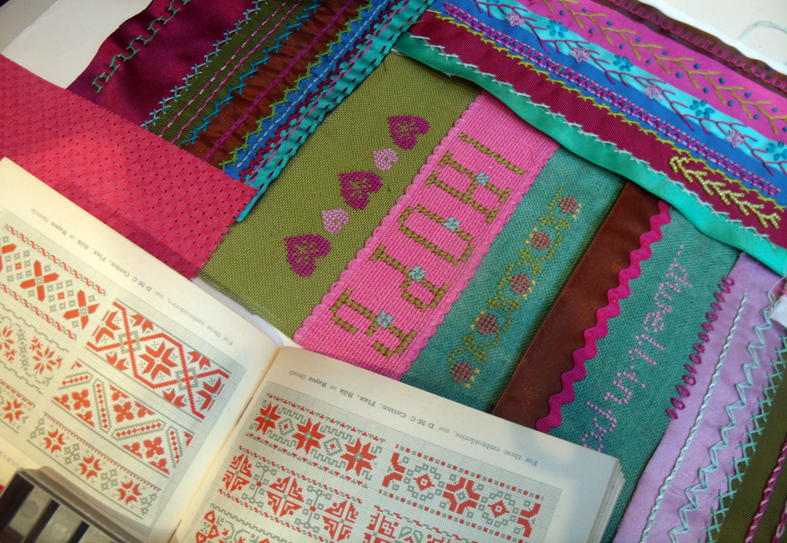 Here is inspiration indeed, but immediately I thought of the Crazy Embroidery classes that I teach at Heart Space Studios, lots of new ideas to create crazy samplers. 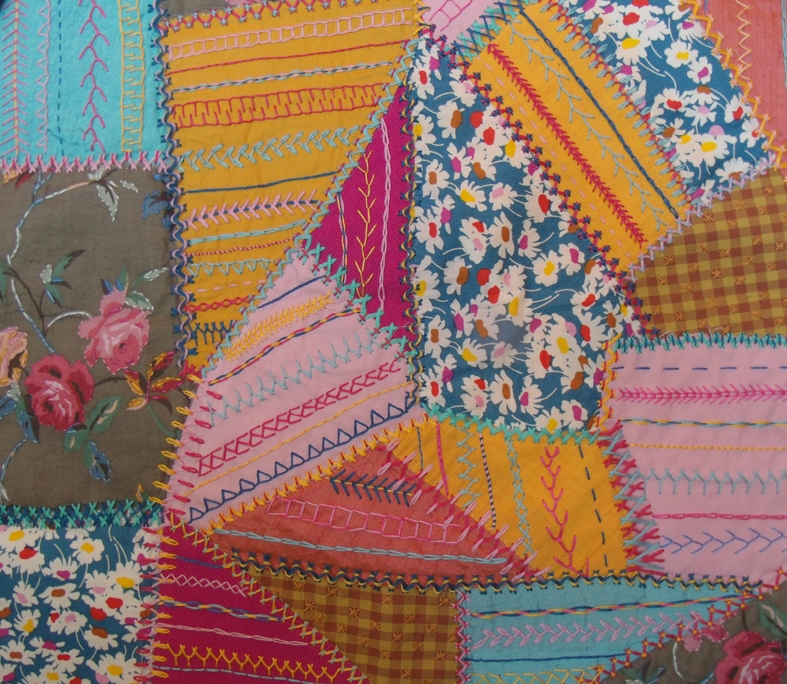 chintz patterns give way to a plain white area. 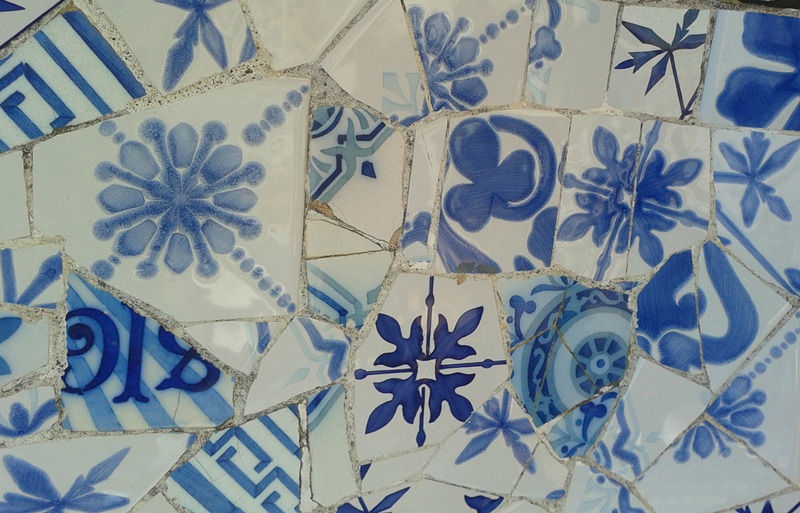 Sometimes the crazy patches were confined to simple shapes and surrounded by a sea of broken ceramics in a wide range of whites, the use of white ceramics when fired and glazed to produce many different variations is a major feature in this garden. 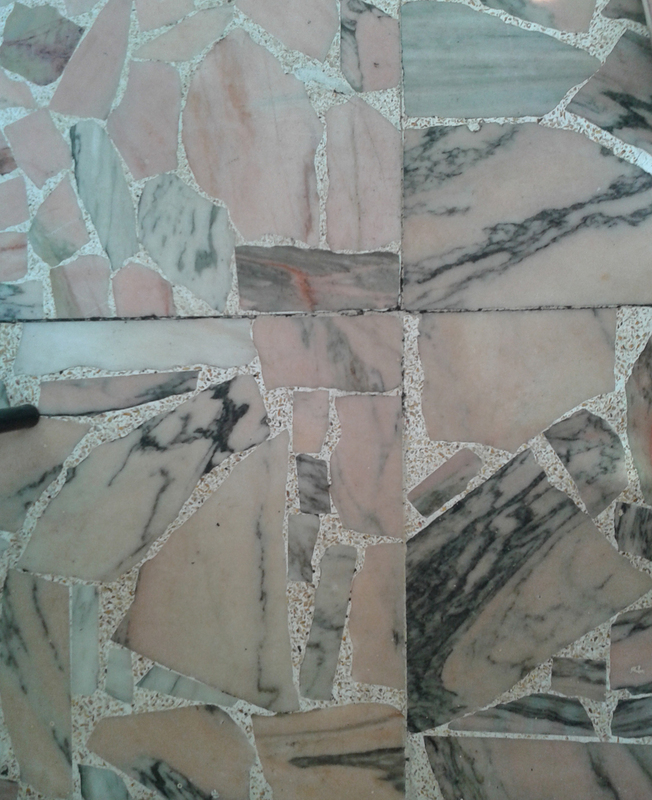 there were other more fluid shapes contained by the white ground…. 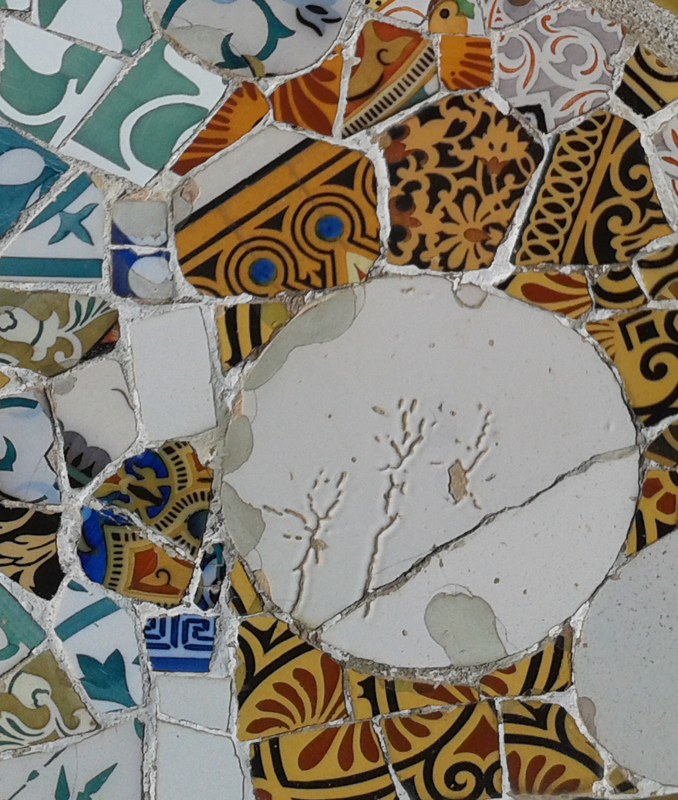 but this whole set of designs is made from re-cycled materials, apart from the abundance of beautiful old and broken patterned tiles from the Spanish ceramic factories, I was happy to see this poorly fired plate used to good effect. 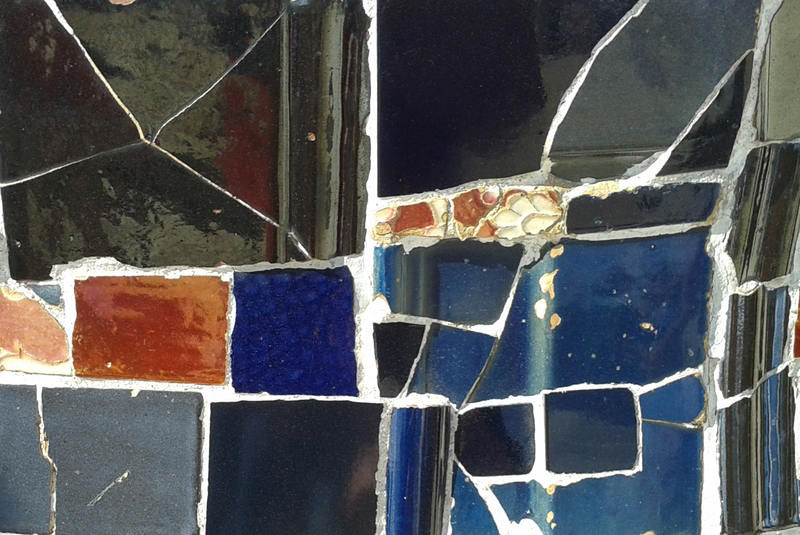 poorly fired glazed plate has been put to good use. 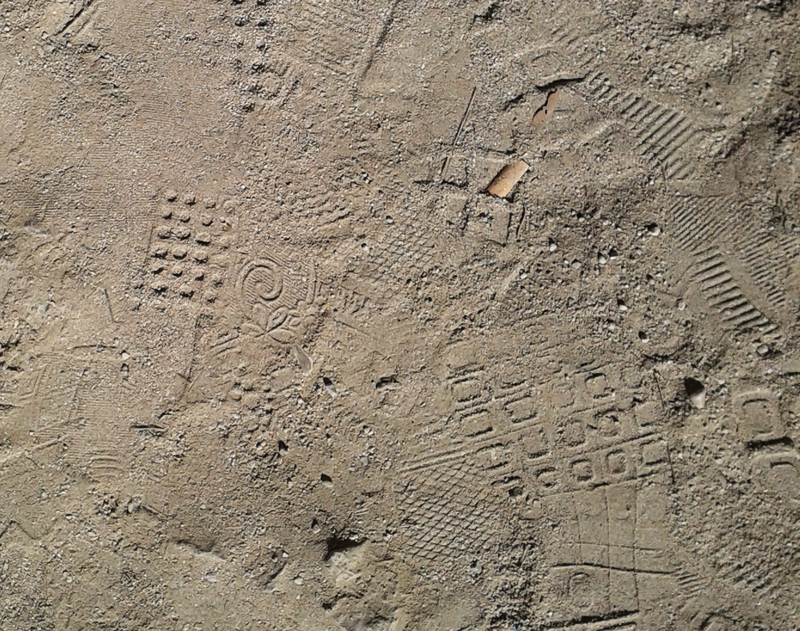 After an hour of my visit I started to see evidence of Crazy everywhere..
looking down at the sandy pathways I saw crazy patterns impressed by the soles of many different shoes, and once out of the park, everywhere I looked was Crazy Heaven. 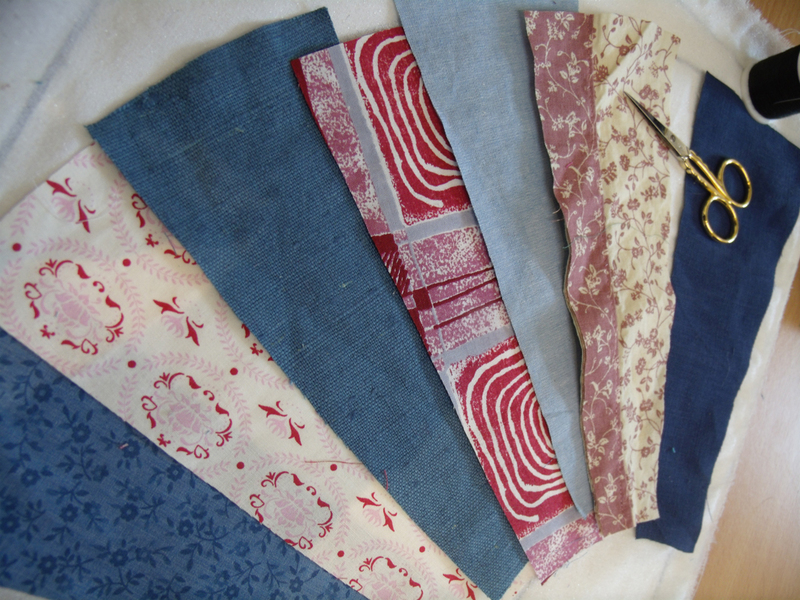 So now I have decided to try to develop some of these ideas into new Crazy Patchwork designs for cushion cover designs to show Hugh Ehrman at Ehrman Tapestry company for their future collections. 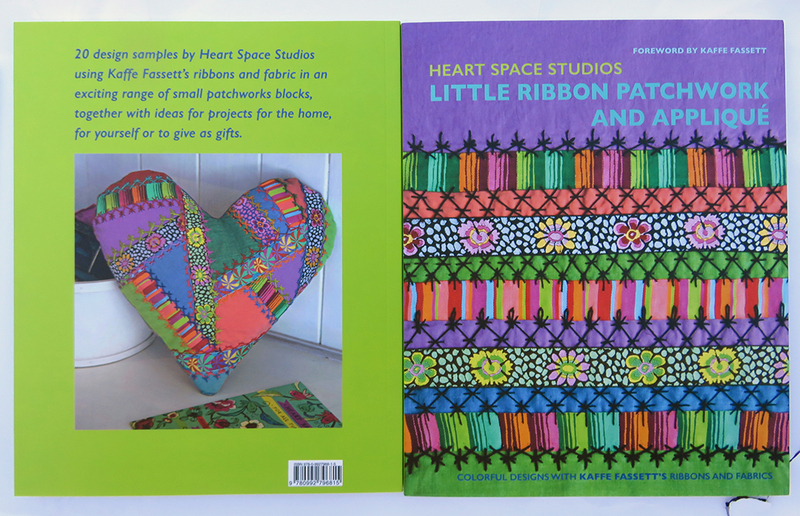 Categories: Crazy Patchwork, Heart Space Studios, Make - Do and Mend | Tags: Barcelona, colour co-ordination, crazy patchwork, Guadi, pattern on pattern, Spanish tiles, textiles | Permalink. 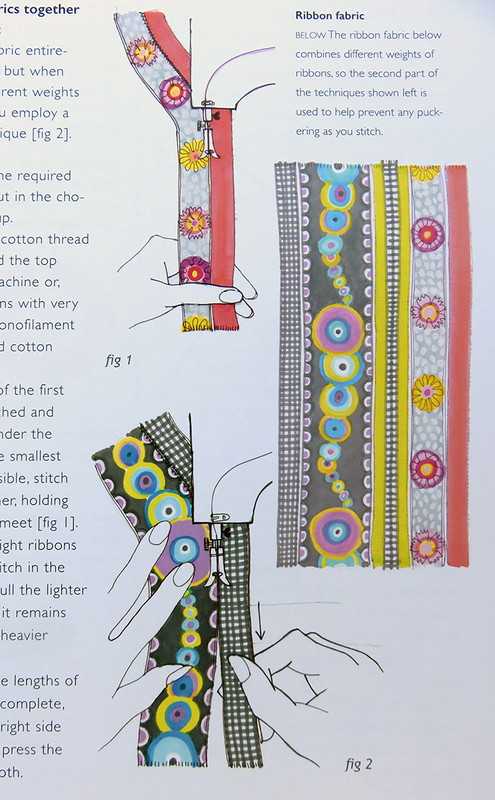 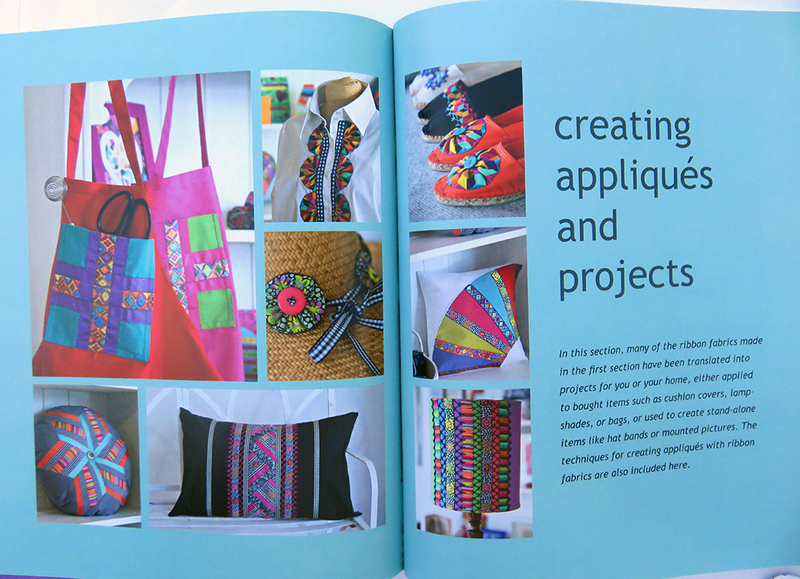 my book of Crazy Patchwork ideas and designs. 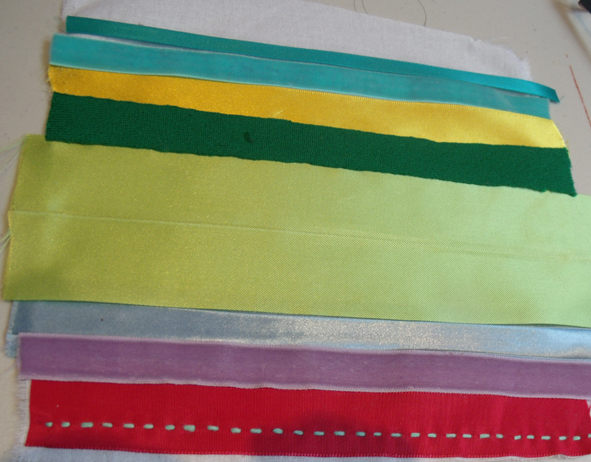 For the FIRST WORKSHOP I started off with the absolute basics, first we chose the colour scheme – I supplied various ribbons and fabrics for people to choose a small group of their favourite colours: this takes longer than anyone imagines it can and causes a lot of negative ideas to flow as people are usually very nervous about using colour, but I have learnt that this choosing is really important as eventually by using the same set of colours in various patterns and proportions the finished piece can be made harmonious. 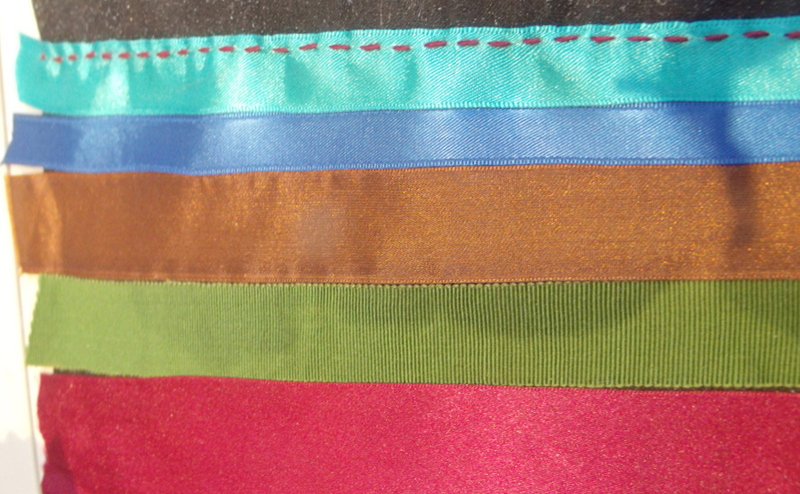 Most people, to their own surprise, choose colours similar to what they are wearing. 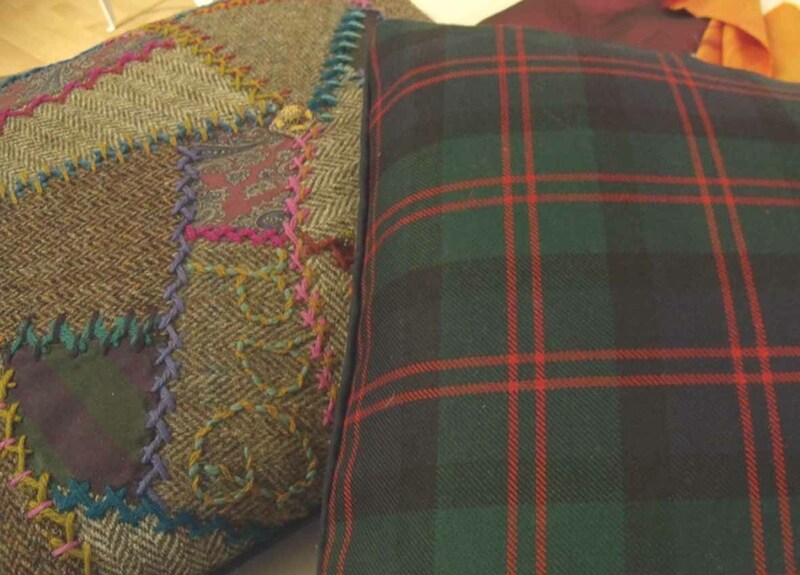 The next choice to be made is the threads – I ask them to choose similar colours to the fabrics but to stitch in complementary coloured threads – so that the stitching will show up. 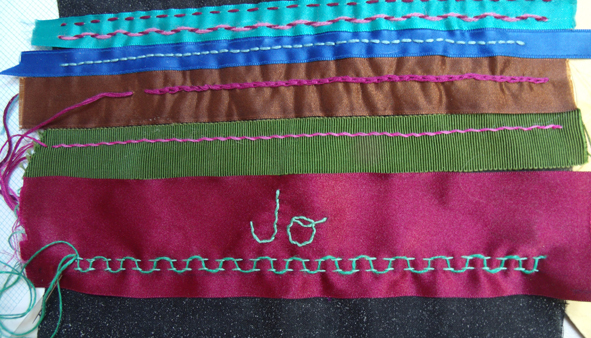 The first sampled stitches are the straight ones – running, back and all the variations, easy does it….but it also includes writing a name…very simple but very effective for the first workshop. 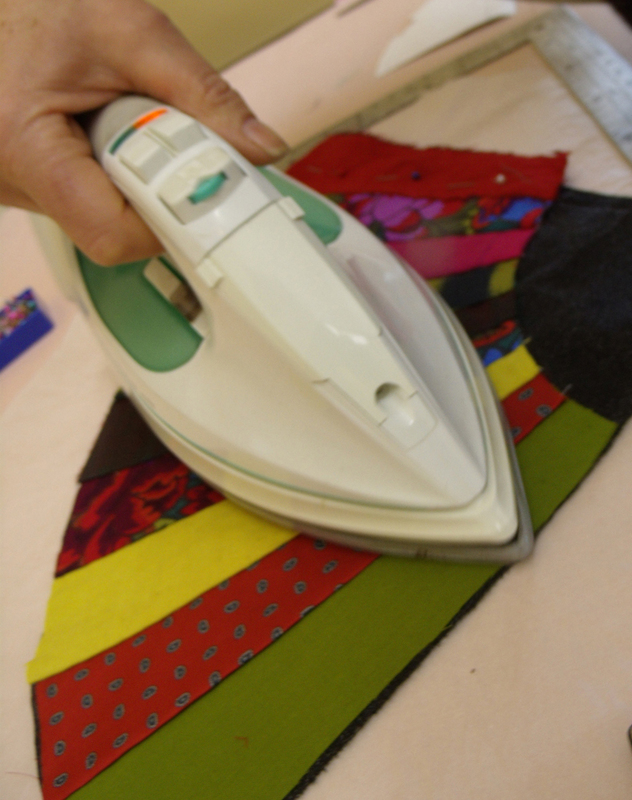 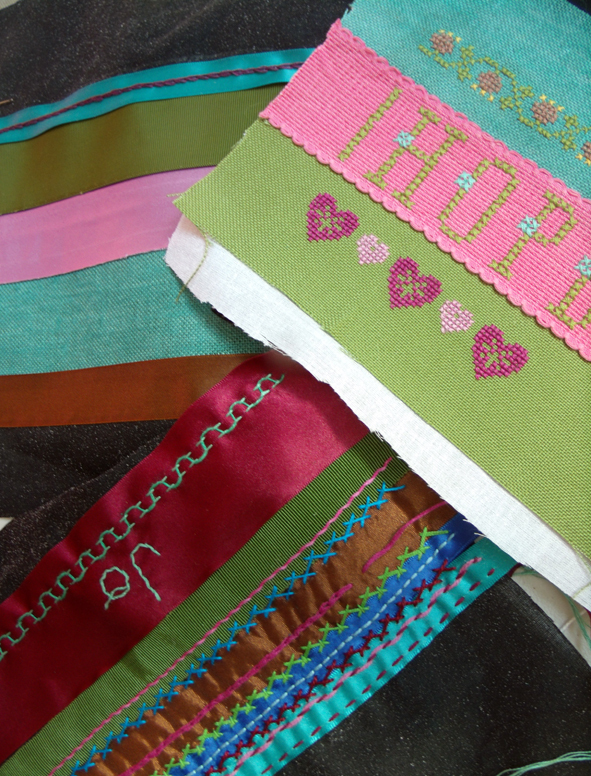 There are various methods of writing onto fabric so that it can be embroidered and we start with the simplest by using a water-soluble pen or the old-fashioned transfer paper still used by dressmakers. 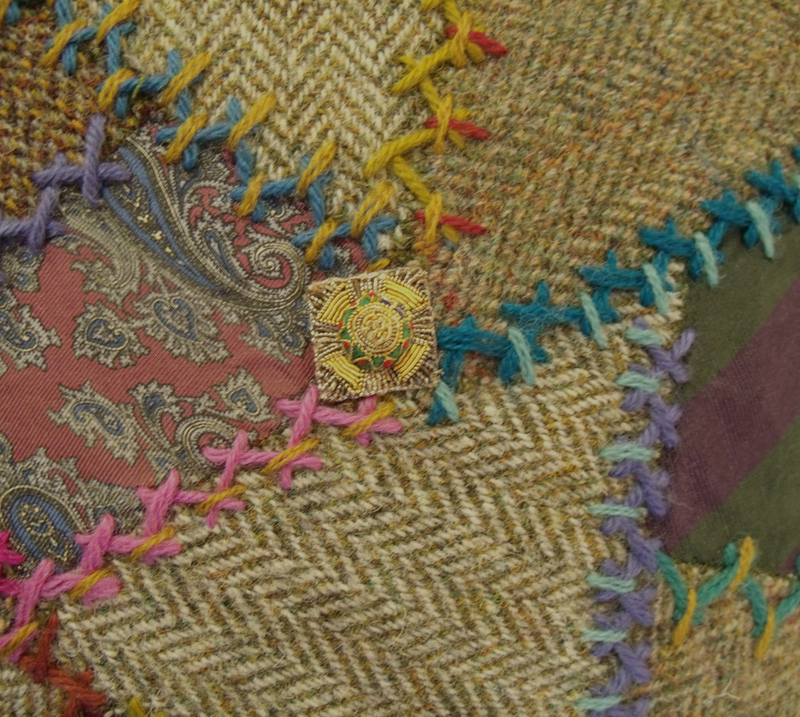 the maker’s name worked in back-stitch over water-soluble pen. 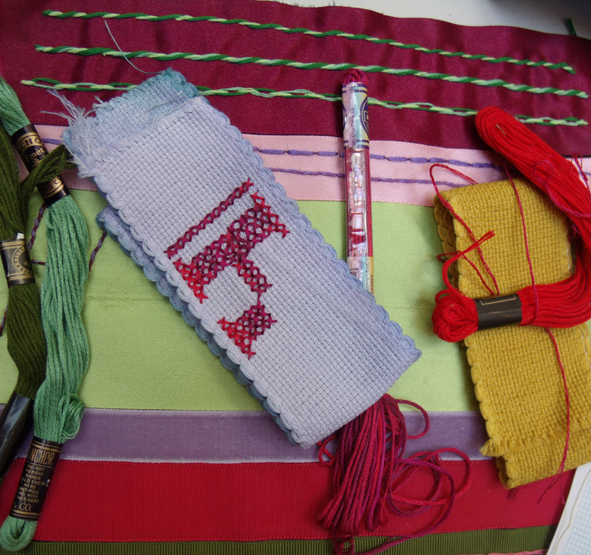 The SECOND WORKSHOPsession was cross stitch, counted and herringbone – which is the main stitch I use for joining the patches together. 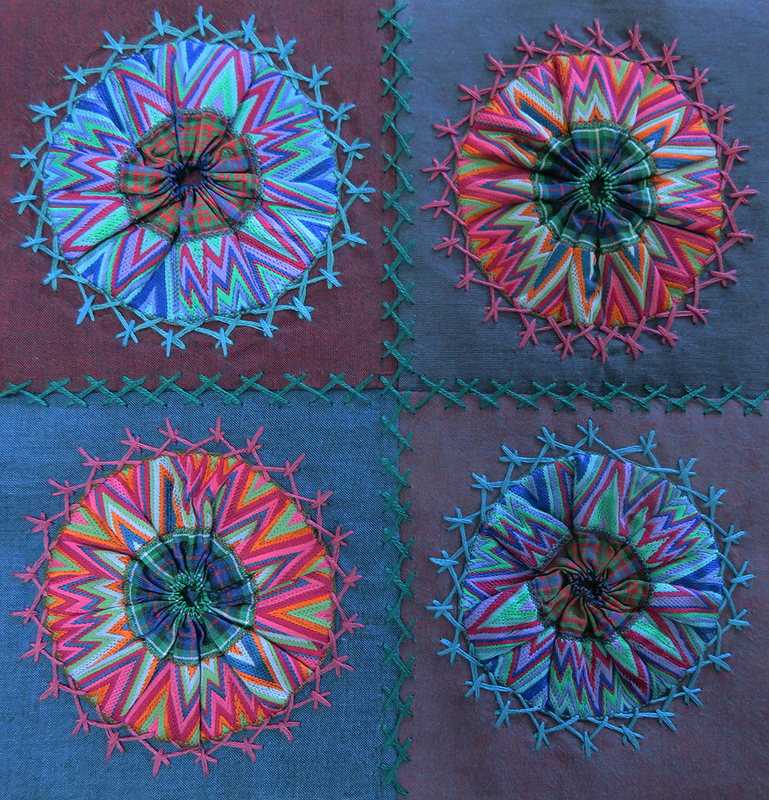 The group was still concerned about colours, but I assured everyone that we had a long way to go and plenty of opportunity to make the whole sampler work in harmony – I was delighted that they had all done ‘homework’ and had finished the first workshop’s ‘patch’ and found more variations to add to the straight stitches. 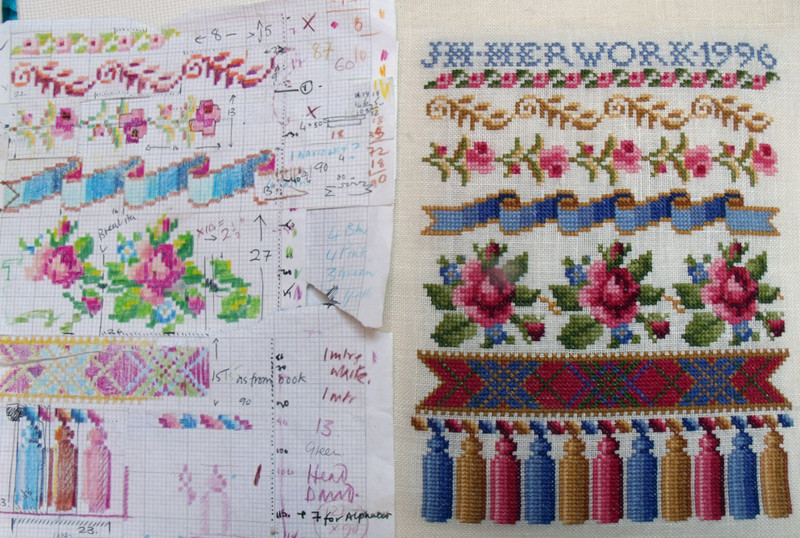 There is a whole world of cross stitch motifs and I like using the traditional ones – to illustrate the technique of charting for cross stitch I showed them some old work of mine that was designed from vintage needlework manuals. 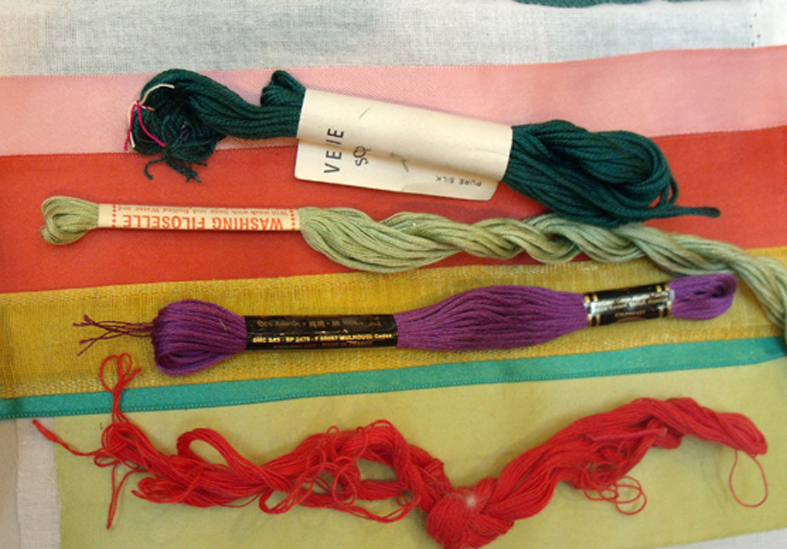 I still work as a freelance designer for a canvas embroidery company, Ehrman Tapestry, where I sometimes use similar charting for some of my designs, even though the stitch for tapestry is tent or half crass stitch. 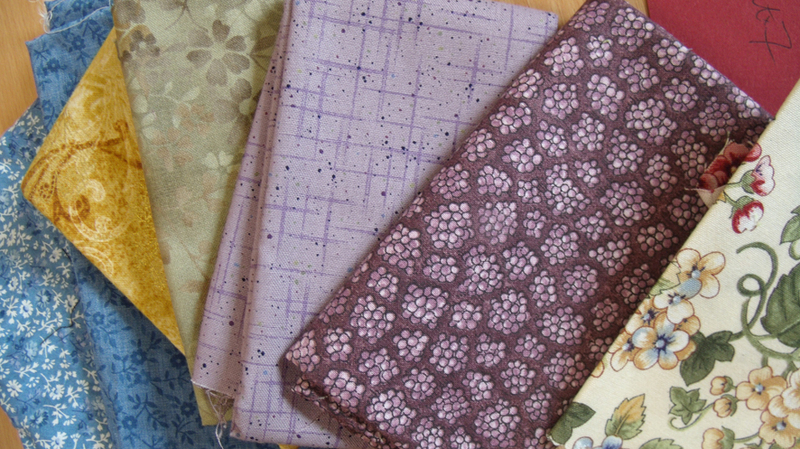 So I have lots of reference material and the group spent an hour of the 3 hour session looking at all my books and notes before they began charting their own designs. 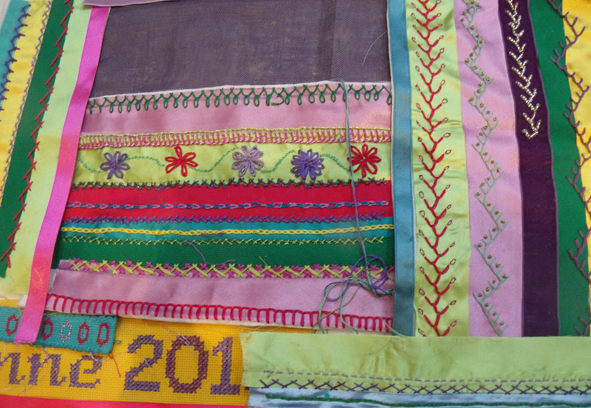 The task for this second session was to chart a name and date as well as a small multi-coloured motif and to stitch it onto the counted thread fabrics. 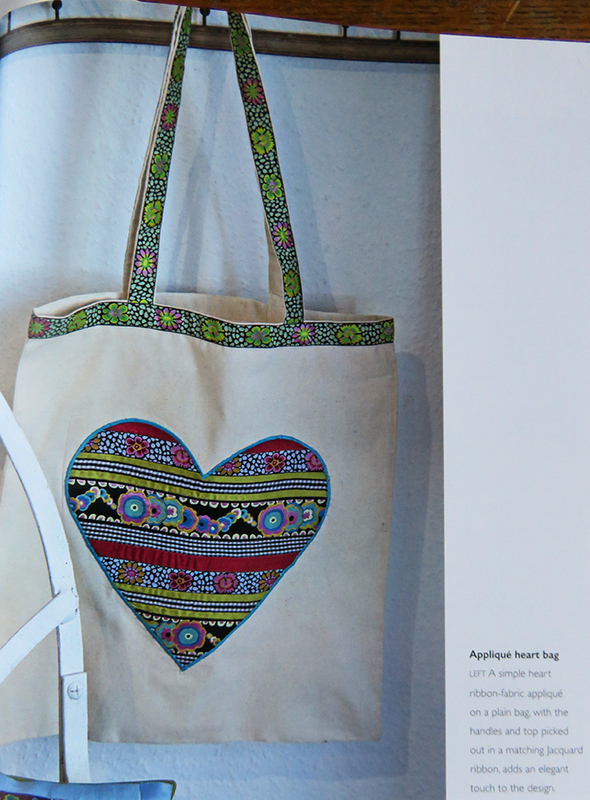 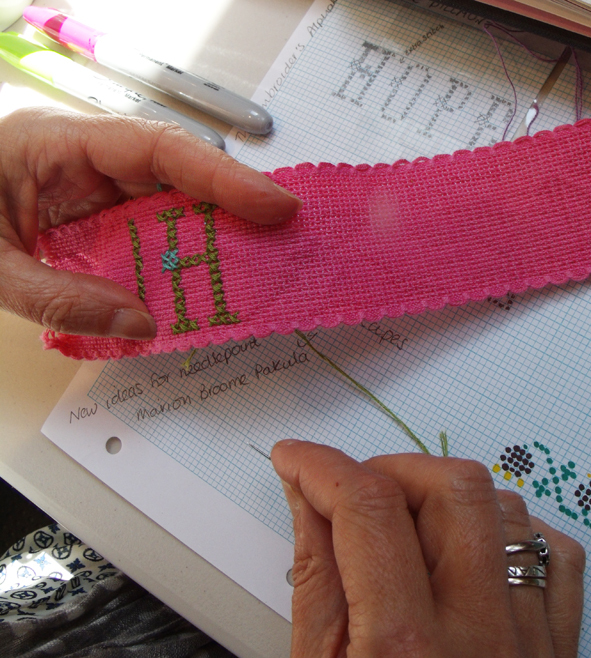 Jo decides to chart and stitch HOPE – she s going for an aspirational crazy sampler. 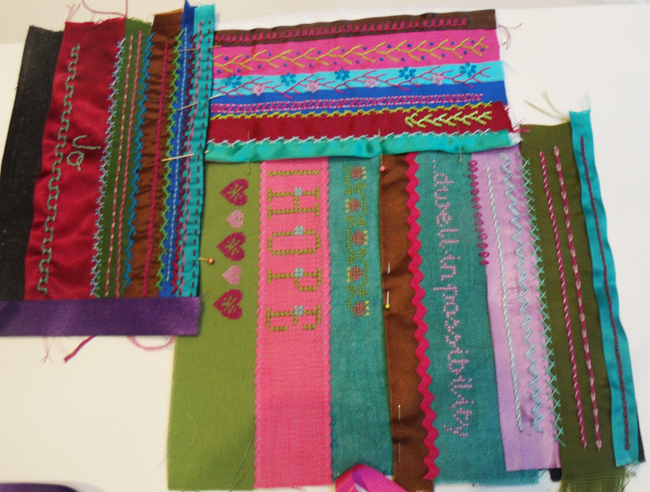 By the THIRD WORKSHOP the patchworks are starting to look very rich and there is less uncertainty about colour choices, everyone seems to be enthralled by this process and are bringing in finished pieces that they have developed at home alone….everyone comments on how good it is to just stop for a time and concentrate on their stitching. 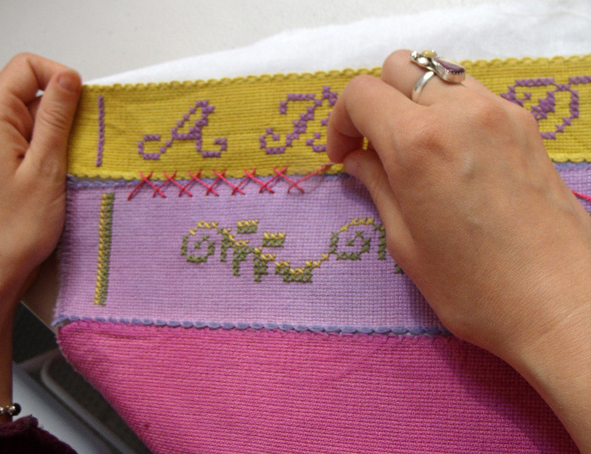 The third week is supposed to be looped stitches – chains and lazy daisies and feather, but we have to spend some time catching up on herringbone as the counted cross stitch took up most of the last class at the studio. 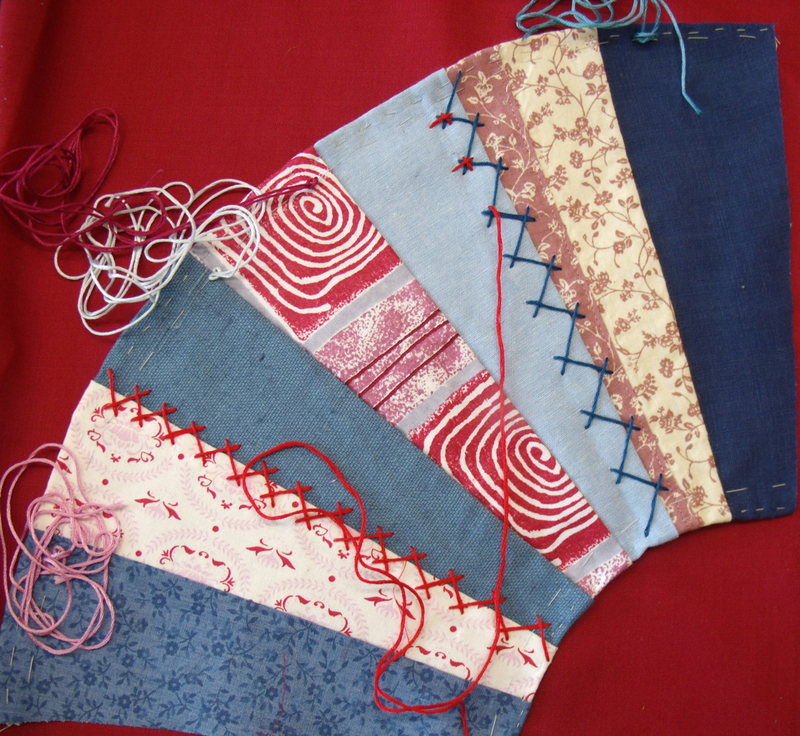 By the LAST WORKSHOP we have got a small range of patches ready to be worked into a whole square. 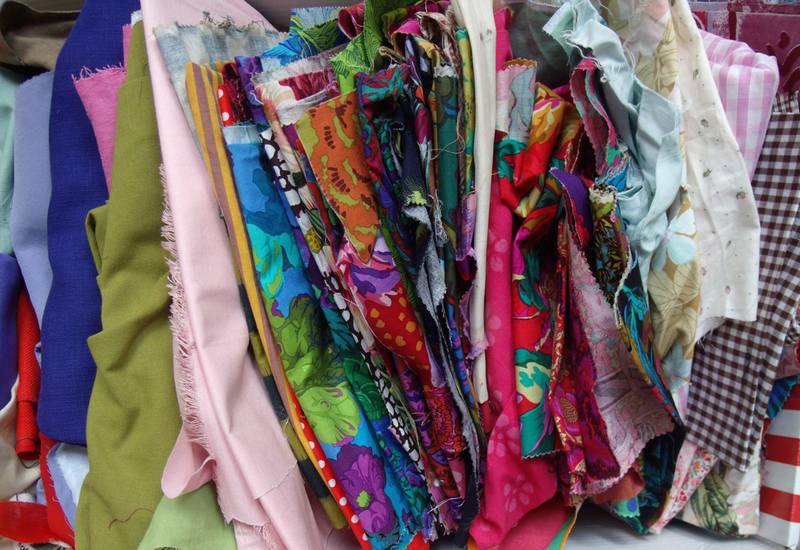 Anne’s collection of patches ready to stitch together. 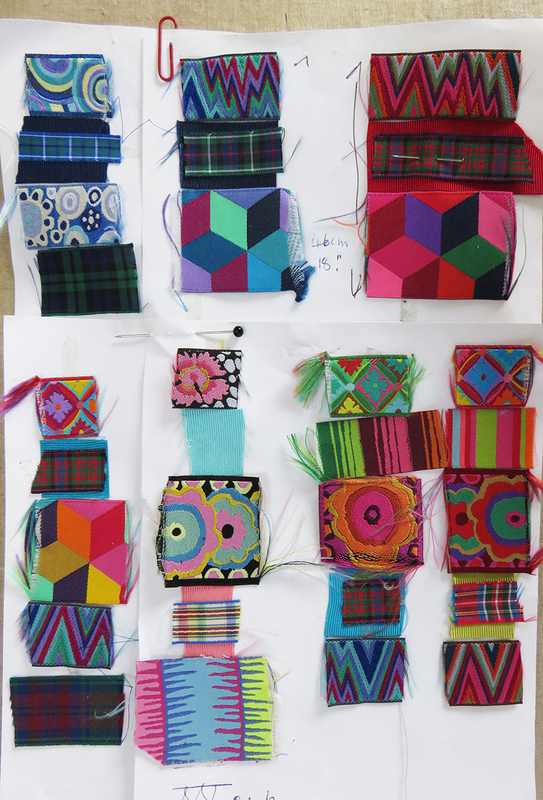 The piecing together of the patches for the last class was easier because of the colour co-ordination of the embroideries, but the strict oblong patches made for geometric patterns for the final piece. 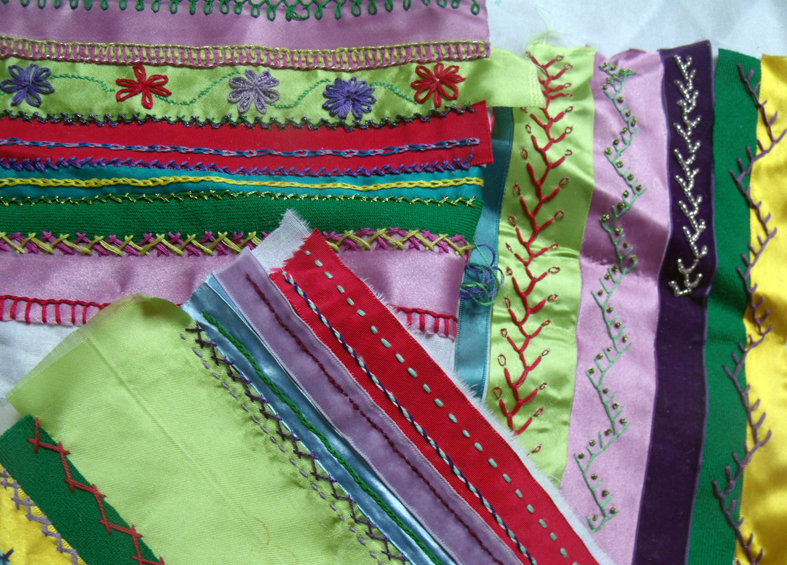 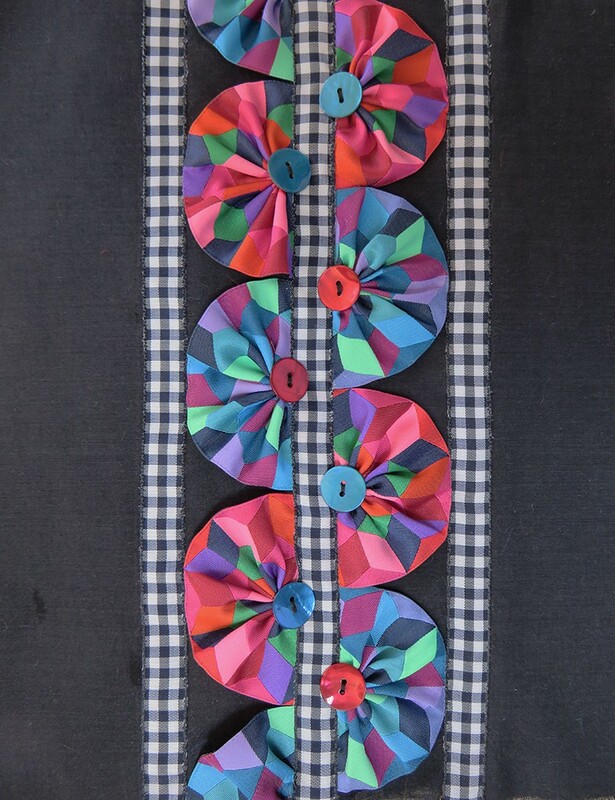 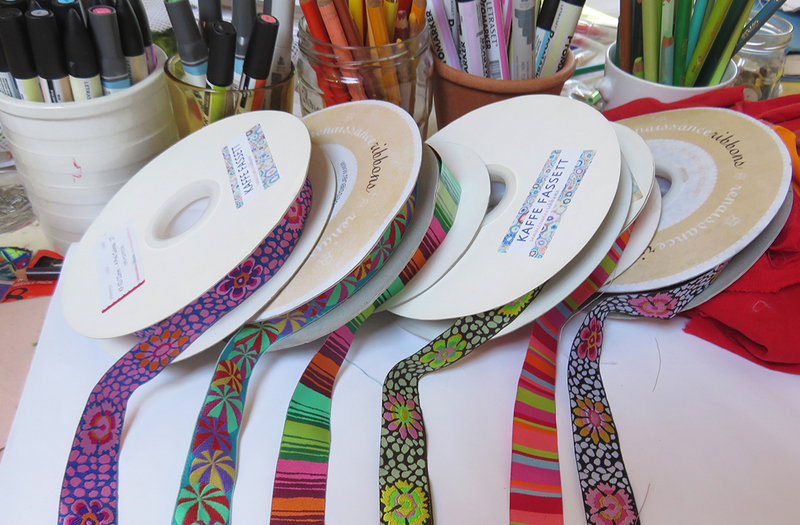 Maybe for the next session of this class I will give each person a triangle as well as oblongs and squares of fabrics to apply the embroidered ribbons on. 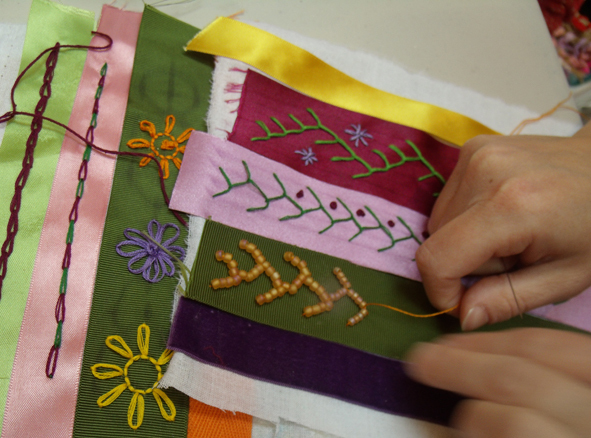 This group of students want to learn more stitches and techniques so I am running an advanced course for them – and other more experienced embroiderers can drop in for single sessions. 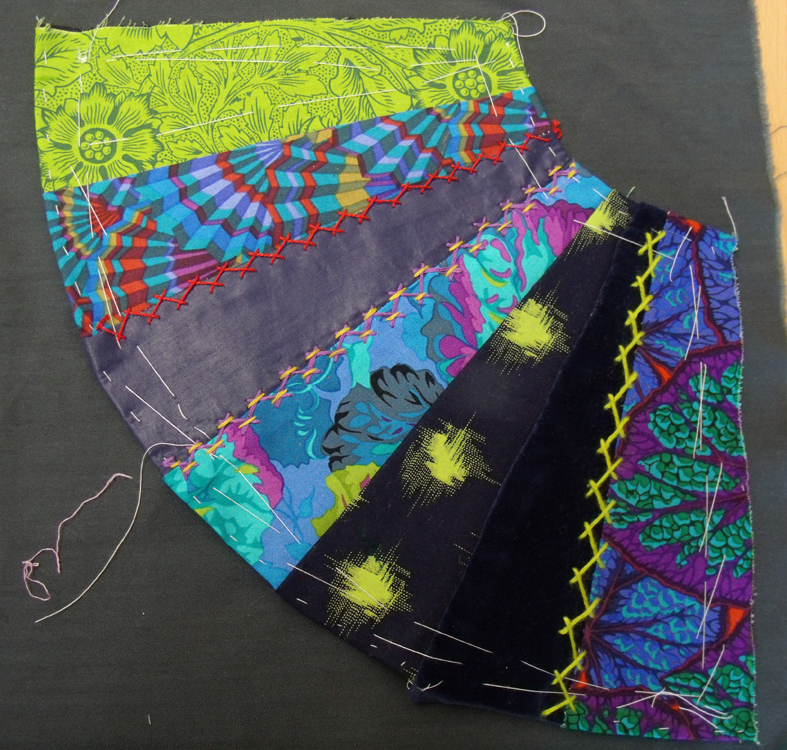 Considering that this group had only 5 classes for 3 hours each they have really advanced their practice in many ways and not just by learning how to stitch. 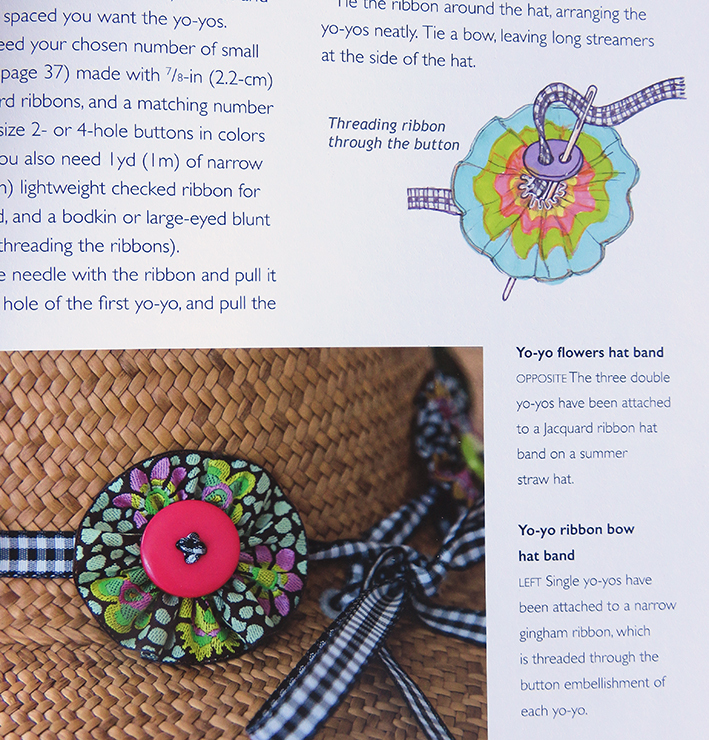 I think that they have caught my bug – the embroidery bug – and are now developing their own libraries and stashes of materials ready to try out new techniques and new ways of expressing themselves. 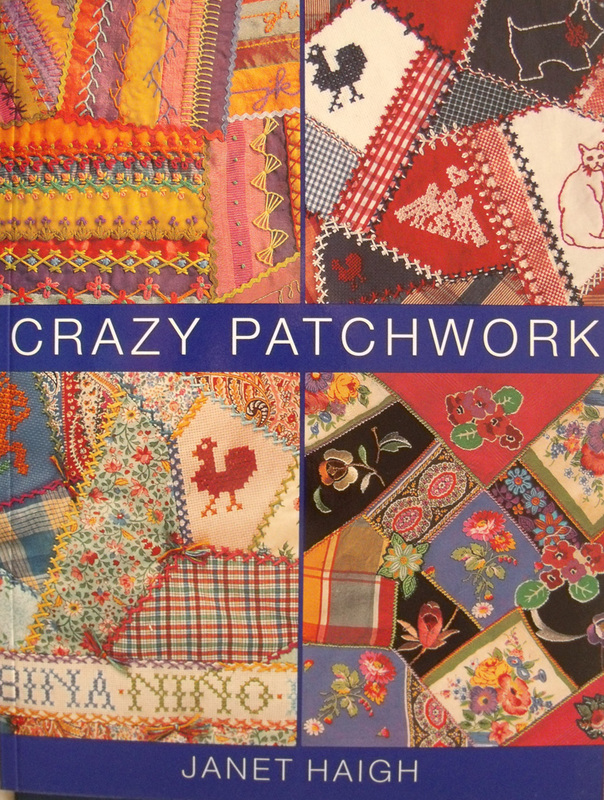 Categories: Crazy Patchwork, Heart Space Studios, Stitching | Tags: colour co-ordination, crazy patchwork, creativity, hand embroidery stitches | Permalink. 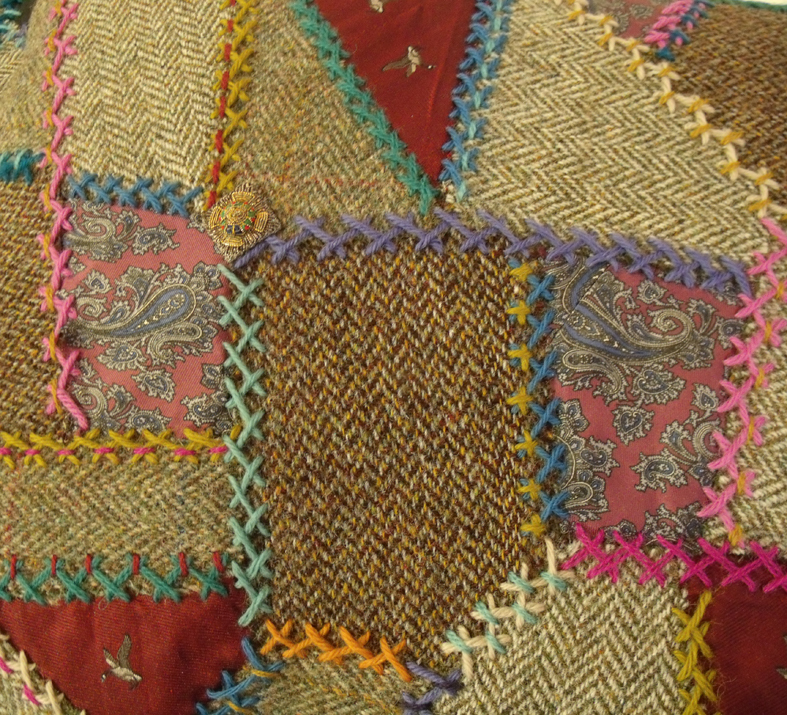 Categories: Crazy Patchwork, Heart Space Studios, Make - Do and Mend, Stitching | Tags: commemorative work, crazy patchwork, tweed patchwork. 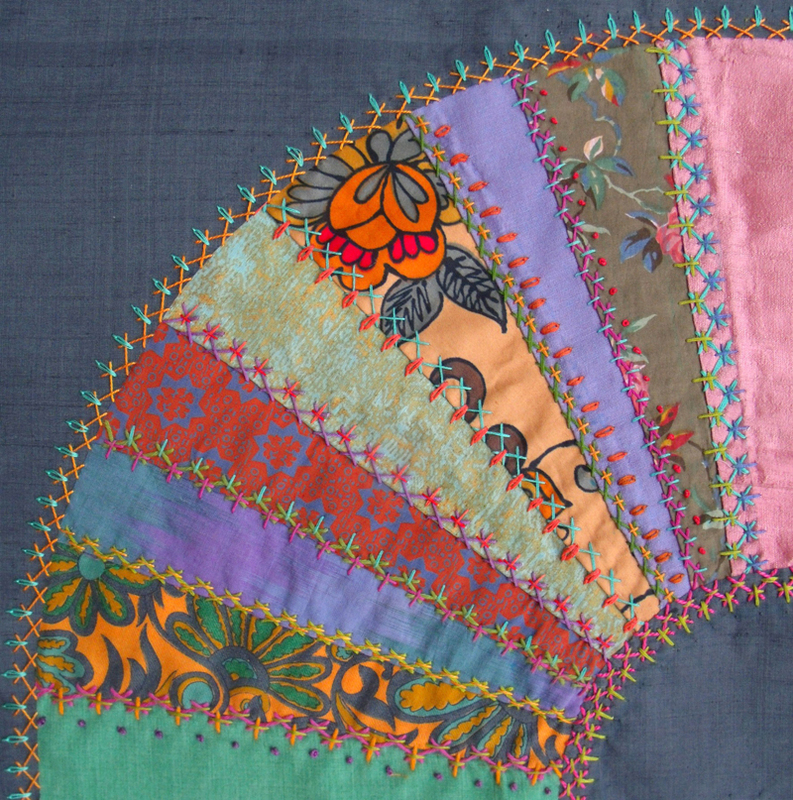 embroidery | Permalink.